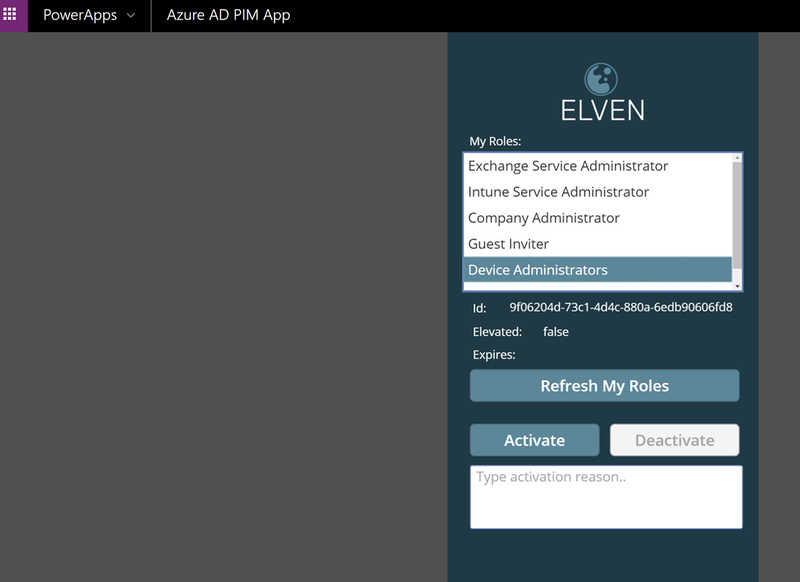 GoToGuy Blog | A Blog about Enterprise Mobility + Security, Azure AD, Datacenter Management, Service Delivery, Automation, Monitoring, Cloud OS, Azure and anything worthwhile sharing with the Cloud and Datacenter community. It is with great pride I can announce that I will speak at Microsoft Ignite – The Tour, in Stockholm April 24-25 2019. This conference, which already is sold out and now only available on waiting list, will be held at Stockholmsmassan, and you can read more about it here: https://www.microsoft.com/sv-se/ignite-the-tour/Stockholm. You will also find me at the experts area and probably doing booth duty, details of that will be updated here when I know more. 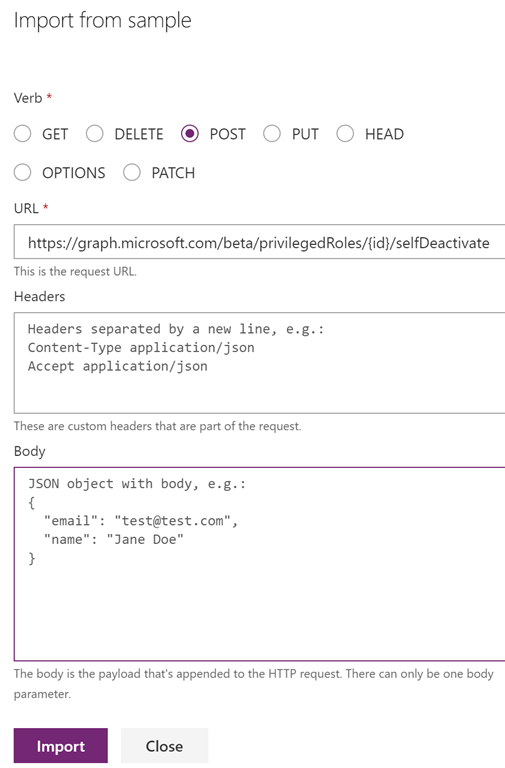 This entry was posted in Enterprise Mobility + Security, Microsoft Graph, MVP and tagged Community, Microsoft Graph, Security on March 25, 2019 by Jan Vidar Elven. 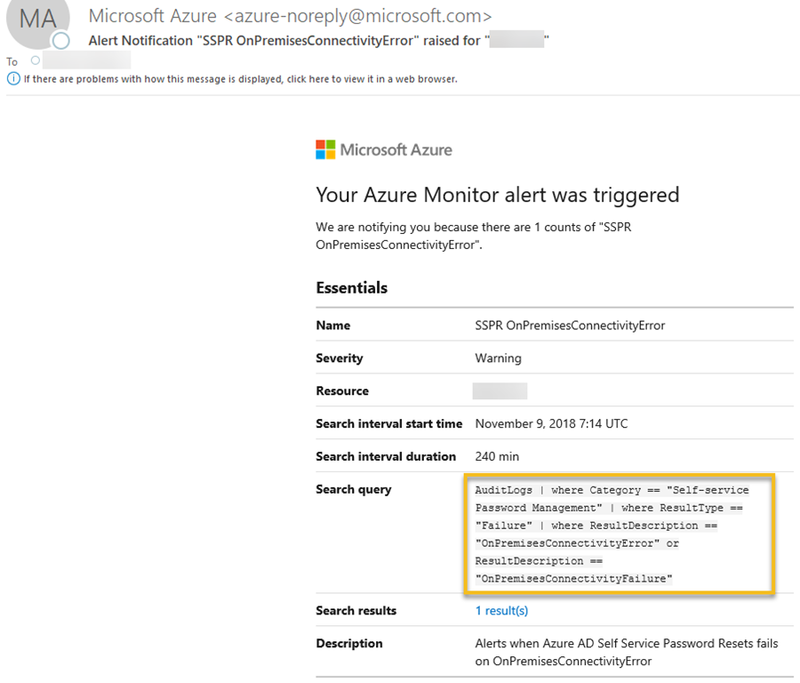 Most IT admins, pros and end users from organizations that use Office 365 and Azure AD will by now have heard about the big Azure MFA outage on Monday November 19. 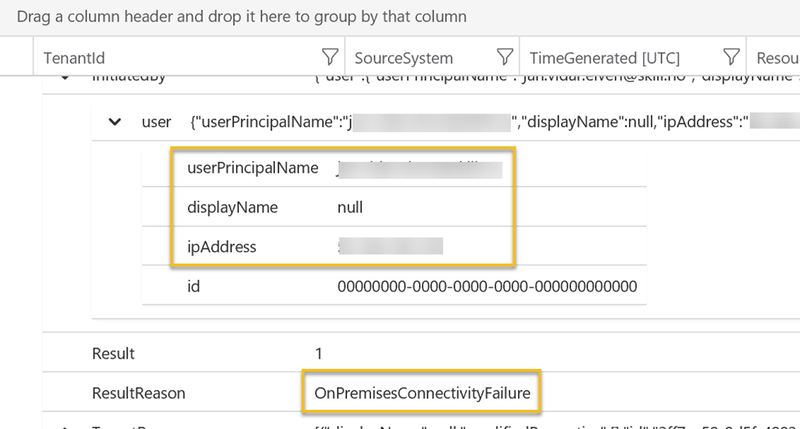 When something like this happens, it is important to get insights on which users that were affected, and in what type of scenarios they most experienced the problem. 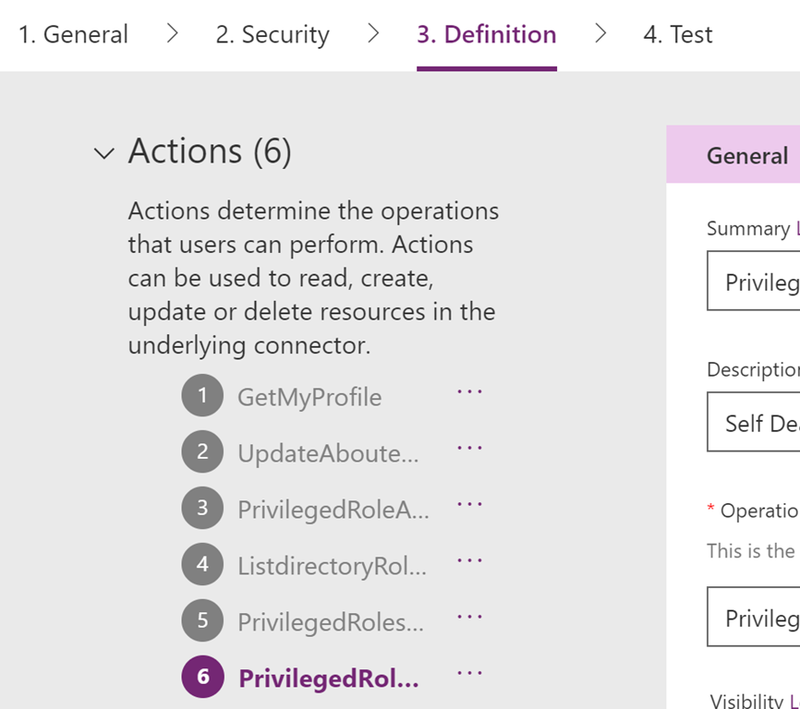 Microsoft MVP Tony Redmond wrote a useful blog post (https://office365itpros.com/2018/11/21/reporting-mfa-enabled-accounts/) on how to report on possible/potentially affected and MFA enabled users, and how to disable and re-enable those users. 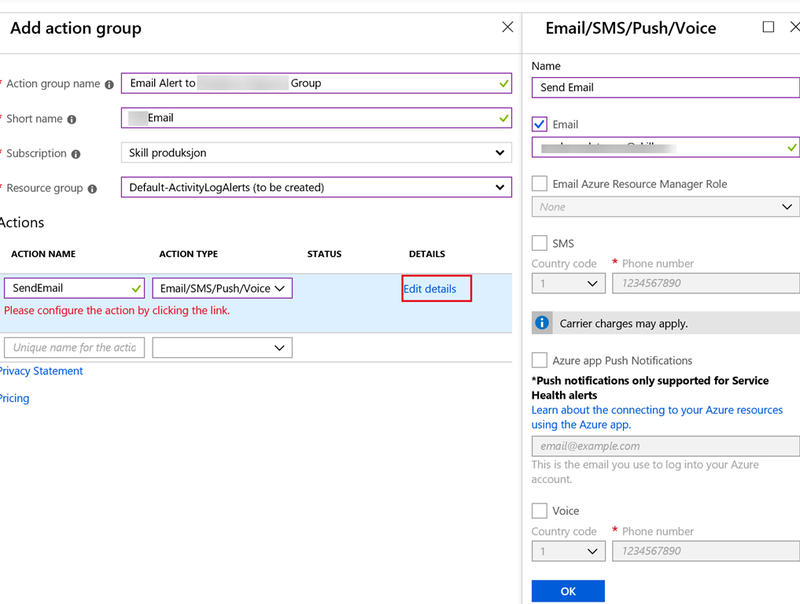 But many organizations are now using Conditional Access policies using Azure AD Premium, so this will be of limited help for those. 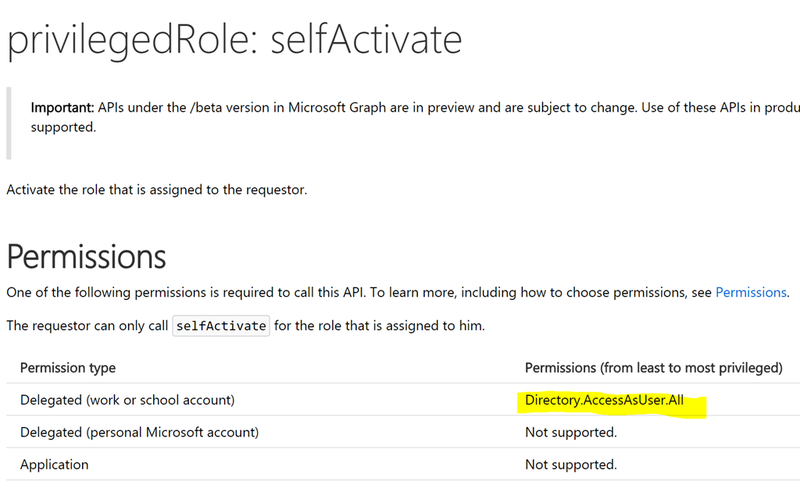 If I could wish one thing from Microsoft for Christmas this year, it would be to be able to manage MFA and Conditional Access policies with Azure AD PowerShell and Microsoft Graph! 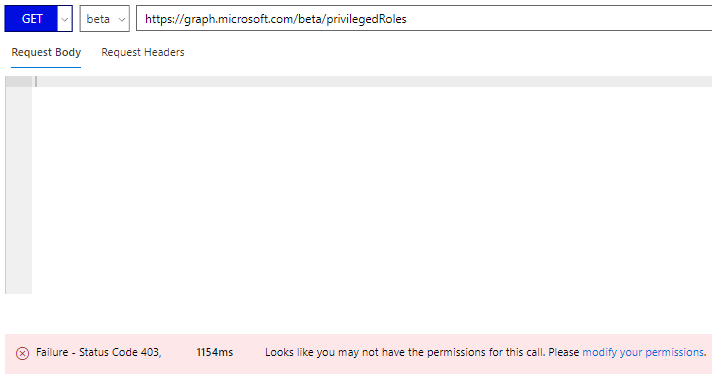 Admins could then run “break-the-glass” administrative users (or even “break-the-glass service principals”) to disable/re-enable policies when big MFA outages happens. A good CA policy design, trusting compliant devices and secure locations could also go a long way in mitigating such big outage problems. 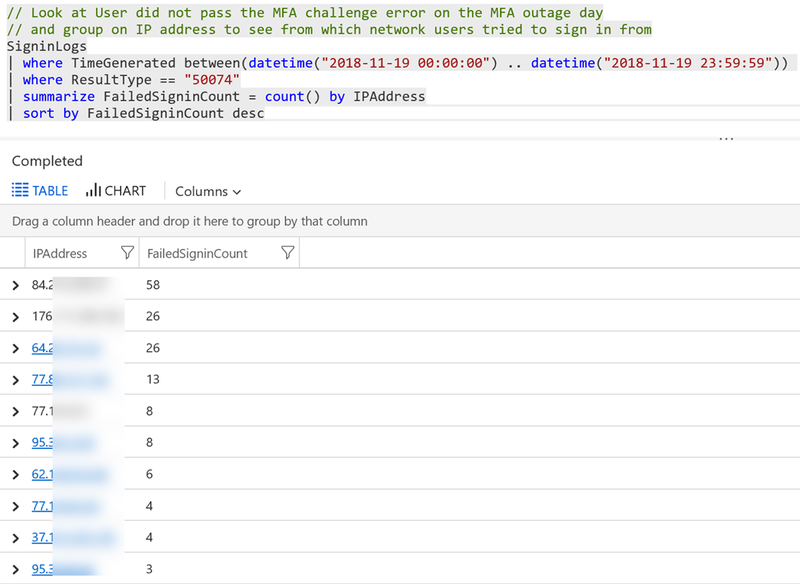 By exploring the Sign-in logs in Log Analytics I could get some more insights into how my organization was affected by the MFA outage on November 19. 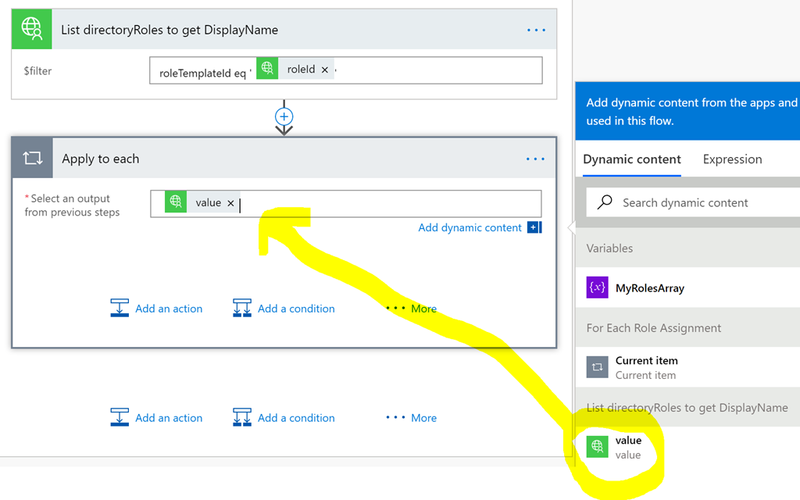 Please see the above blog post on how to get started setting up this integration, the rest of this blog post will show some sample queries for the SigninLogs. 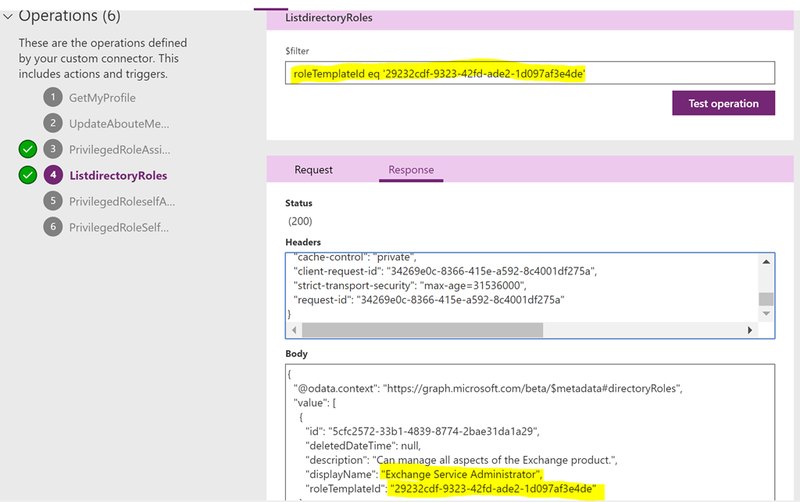 All the queries seen below are shown in screenshot images, but I have listed all them for you to copy at the end of the blog post. 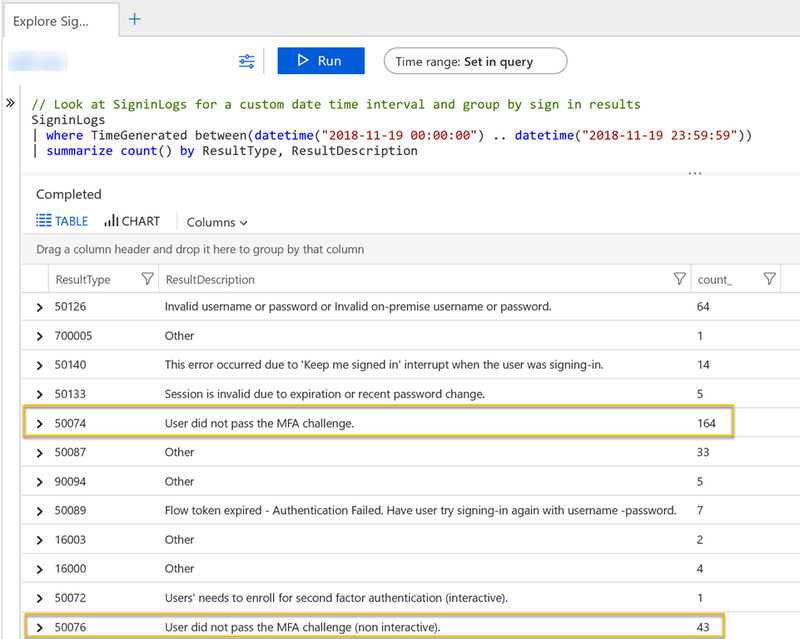 First I can take a look at the SigninLogs for the specific day of 19th November, and the grouping on the result type and description of the sign-in events. 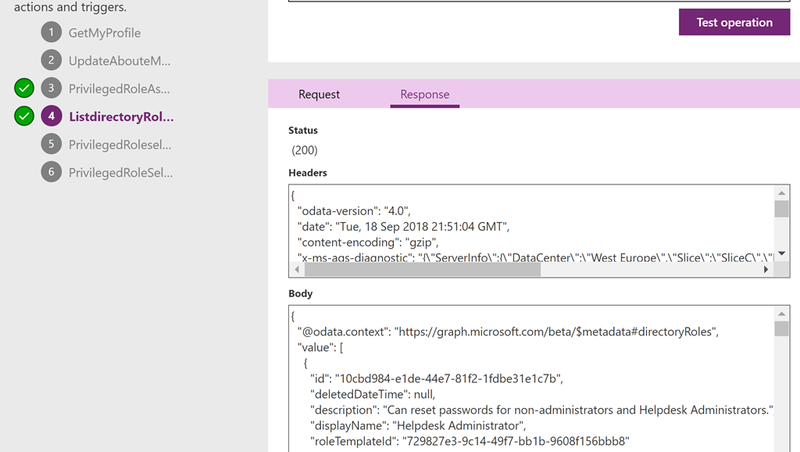 For example I can see that there is a high number of event 50074: User did not pass the MFA challenge. 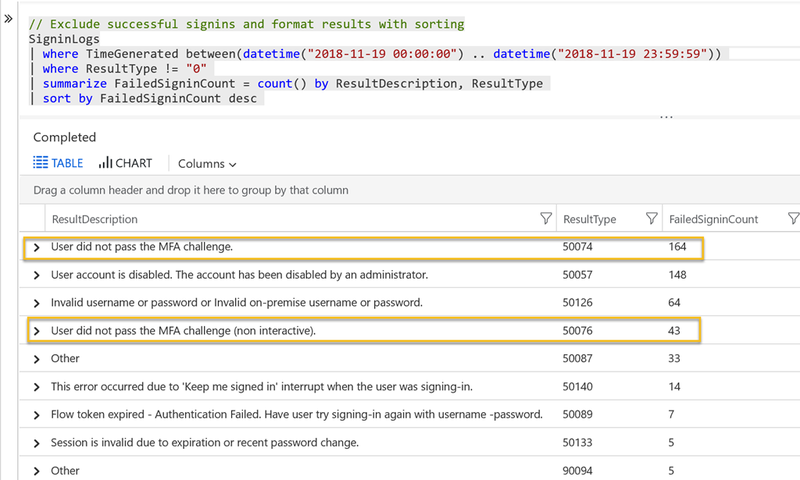 Interestingly there is also a relatively high number of invalid username or password, that could be a separate issue but could also be that users that fails MFA sign-ins tries to log in again thinking they had wrong password first time. 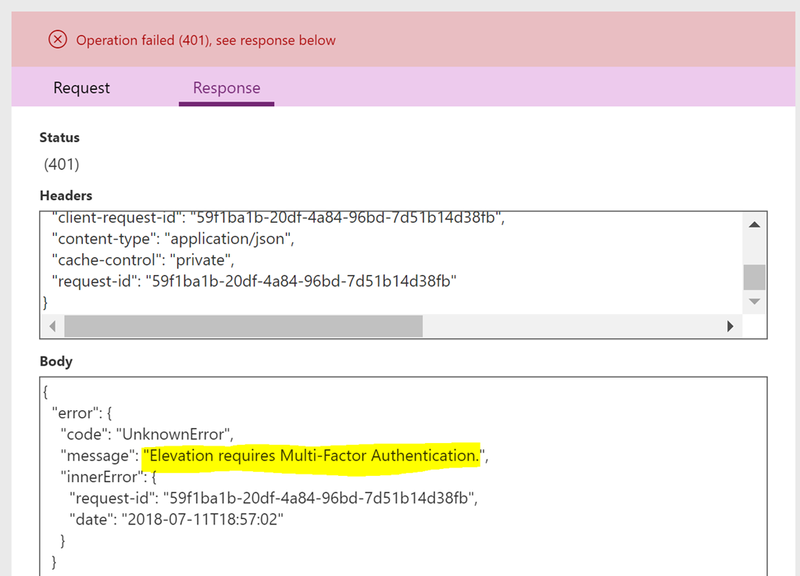 In this next query I focus on the “50074: User did not pass the MFA challenge” error. 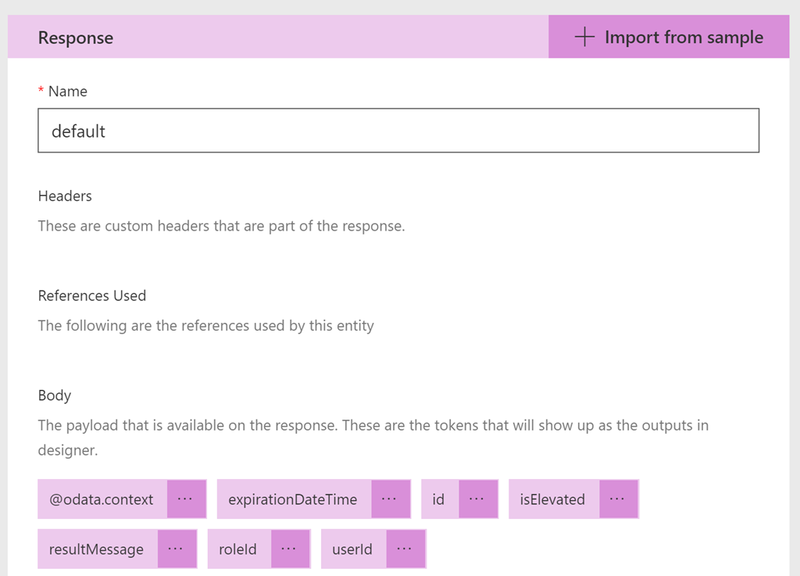 By increasing the time range to last 31 days, and adding a bin(TimeGenerated, 1d) to the summarize group, I’ll be able to see the count of this error on each day in the last month. This will give me a baseline, and we can see that on the 19th this number spikes. I have added a render to timechart for graphical display. There are also some other days where this number increases, I can look into more insights for that if I want as well, but for now I will focus on the 19th. 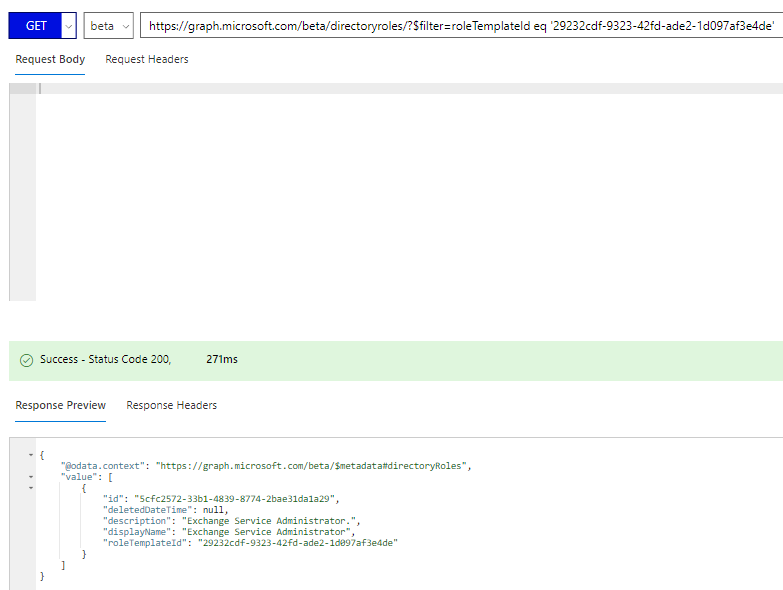 Lets look at some queries for how this error affected my environment. 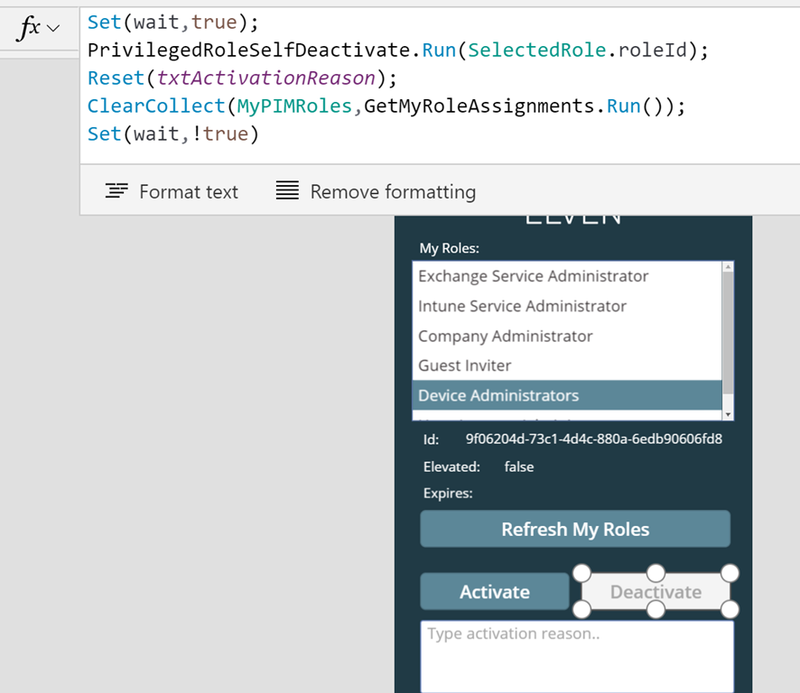 First I can group on the Users and how many errors they experience. Some users were really persistent in trying to get through the MFA error. I have masked the real names. We also see some admin accounts but admins quickly recognized that something was wrong, and actively sought information on the outage. 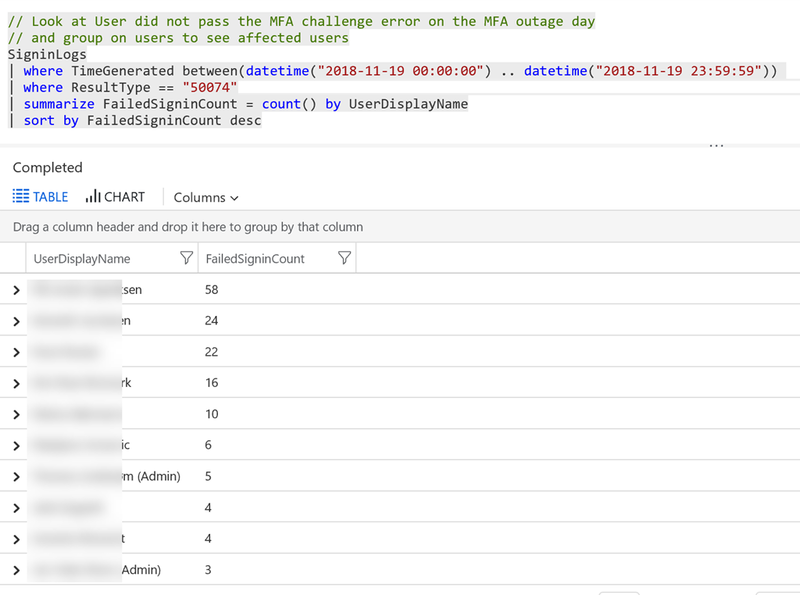 By midday most users were notified on the on-going outage and the number of errors slowly decrease during the day. 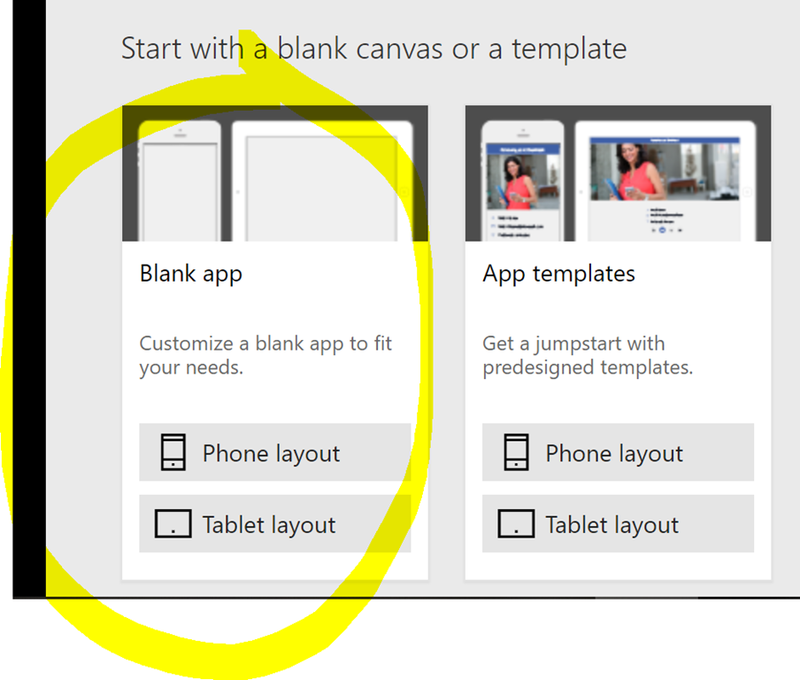 And in this following query, what kind of Client App they used. It would be normal that Browser is quite high, as mobile apps and desktop clients are more likely to have valid refresh tokens. 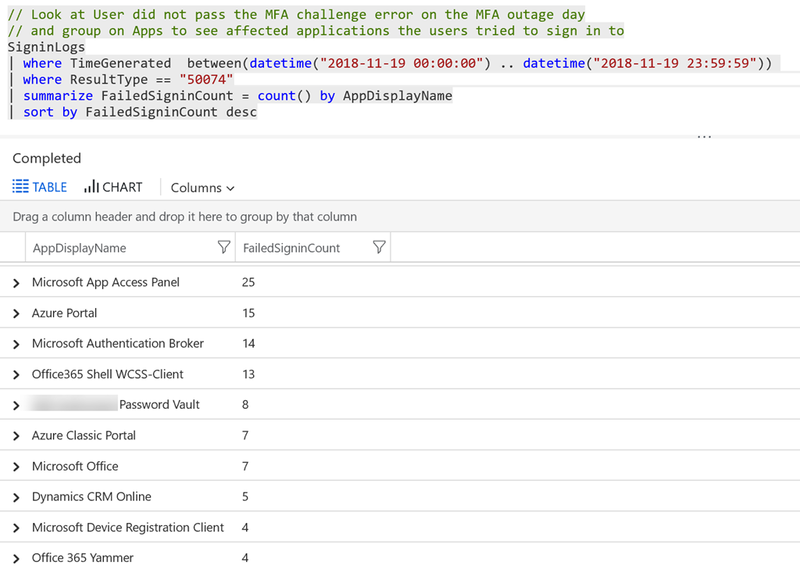 Querying Log Analytics for Sign-in events as shown above can provide valuable insights into how such an outage can affect users. 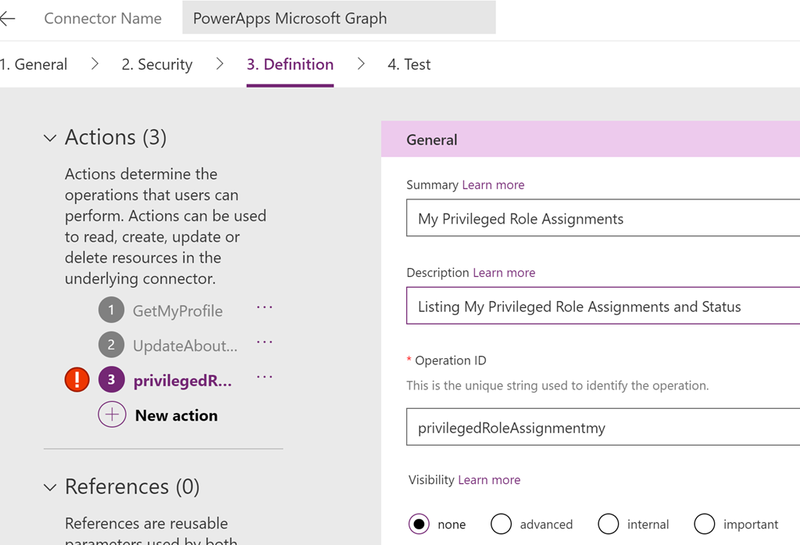 This can also give me some input on how to design Conditional Access policies. 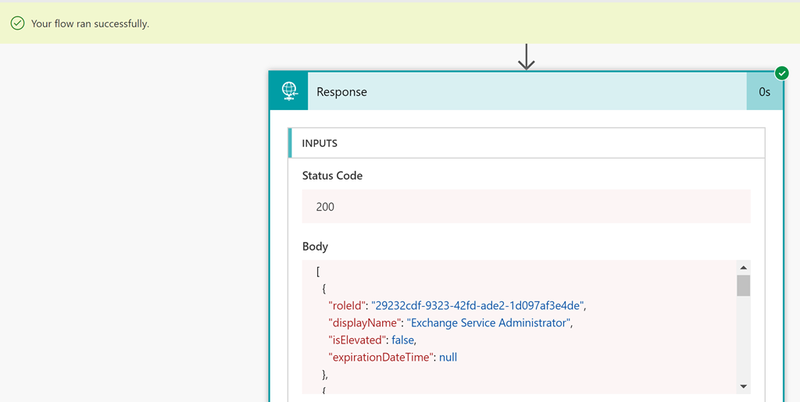 Querying this data over time can also provide a baseline for normal operations in your environment, and make it easier to set alert thresholds if you want to get alerts when number of failures inside a time interval gets higher than usual. 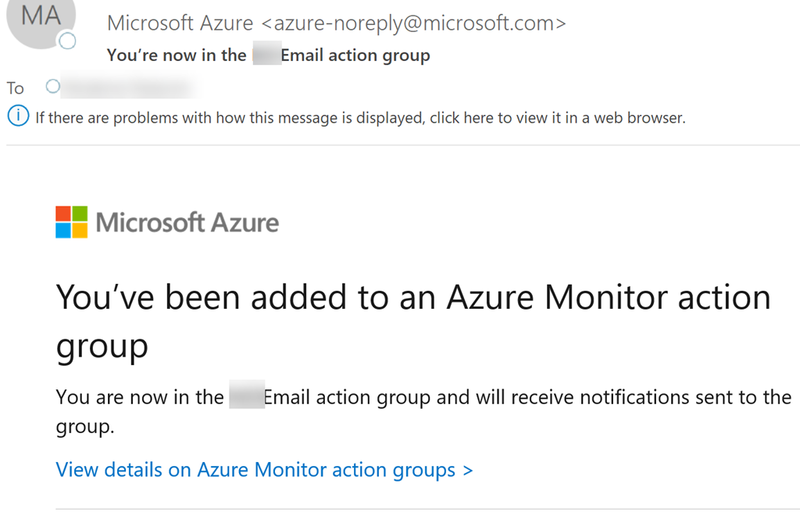 Using Azure Monitor and action groups you can be pro-active and be notified if something similar should occur again. 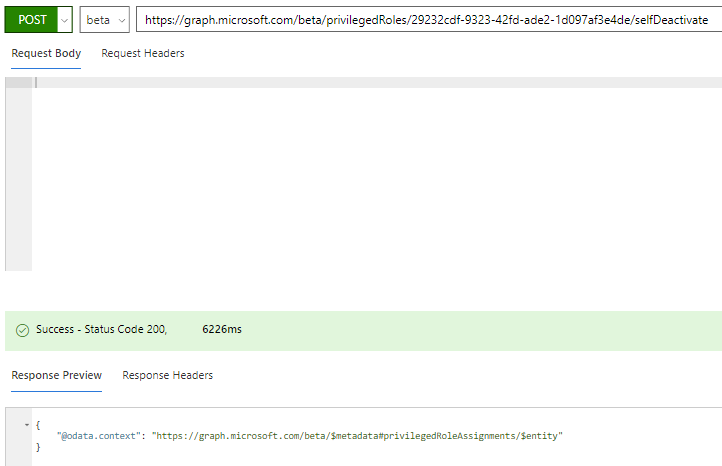 | where ResultType != "0"
| where ResultType == "50074"
This entry was posted in Azure AD, Azure MFA, Log Analytics and tagged Azure AD, Azure MFA, Log Analytics on November 21, 2018 by Jan Vidar Elven. 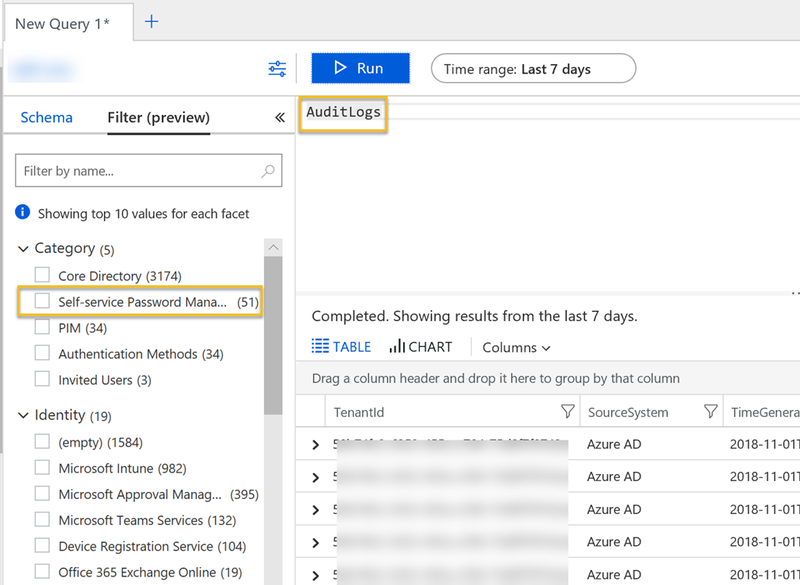 Recently I wrote a blog post on how to get started with integration of Azure AD Activity Logs to Azure Log Analytics. 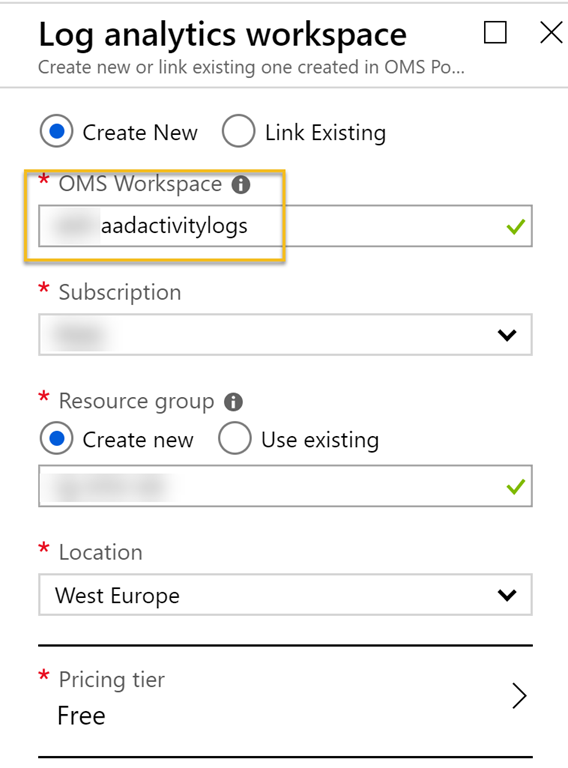 Setting up this is a requirement for the solution in this blog post, so make sure you have set this up first: https://gotoguy.blog/2018/11/06/get-started-with-integration-of-azure-ad-activity-logs-to-azure-log-analytics/. 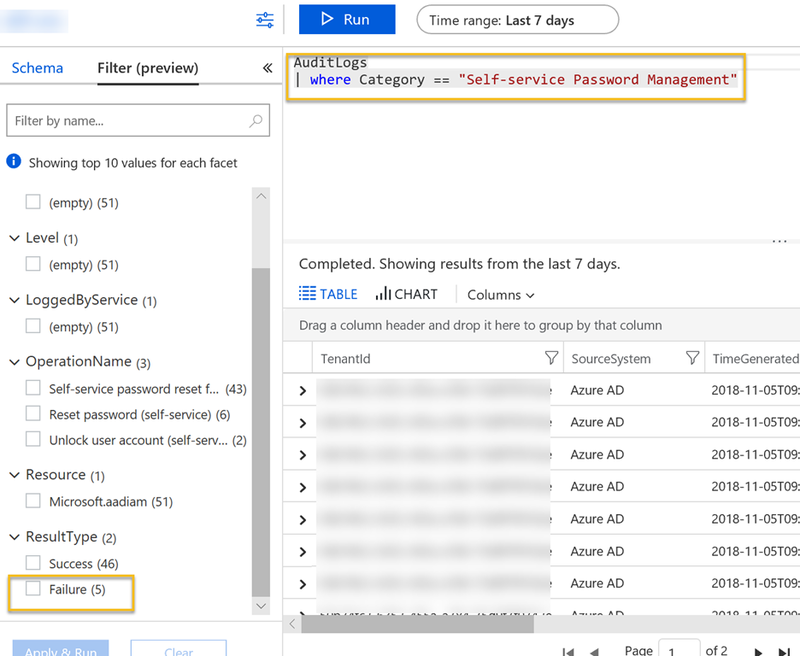 In this blog post I wanted to show a practical example on how to create an alert for when Azure AD Self Service Password fails in password writeback because of connectivity error to the On-premises environment. 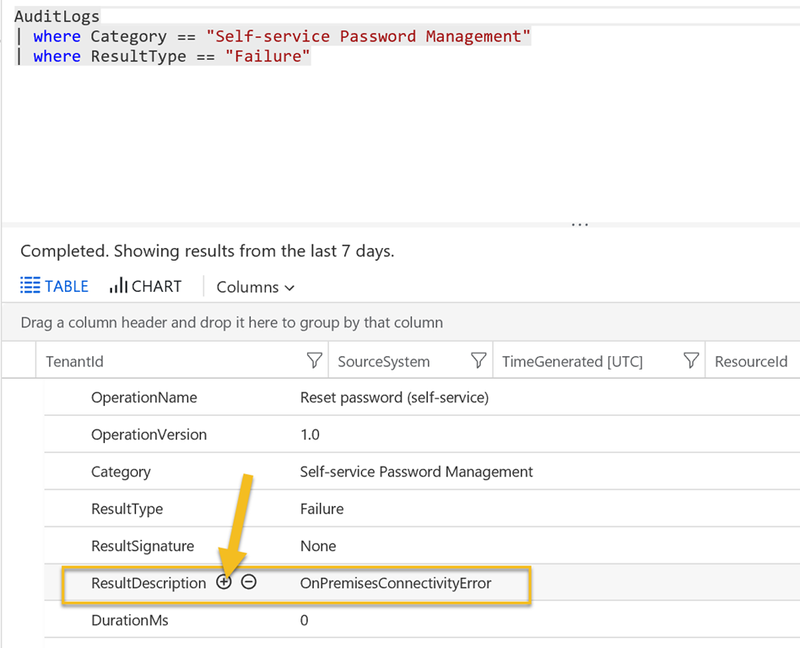 | where Category == "Self-service Password Management"
| where ResultType == "Failure"
| where ResultDescription == "OnPremisesConnectivityError" or ResultDescription == "OnPremisesConnectivtyFailure"
Trigger e-mail, SMS, push or other notifications. 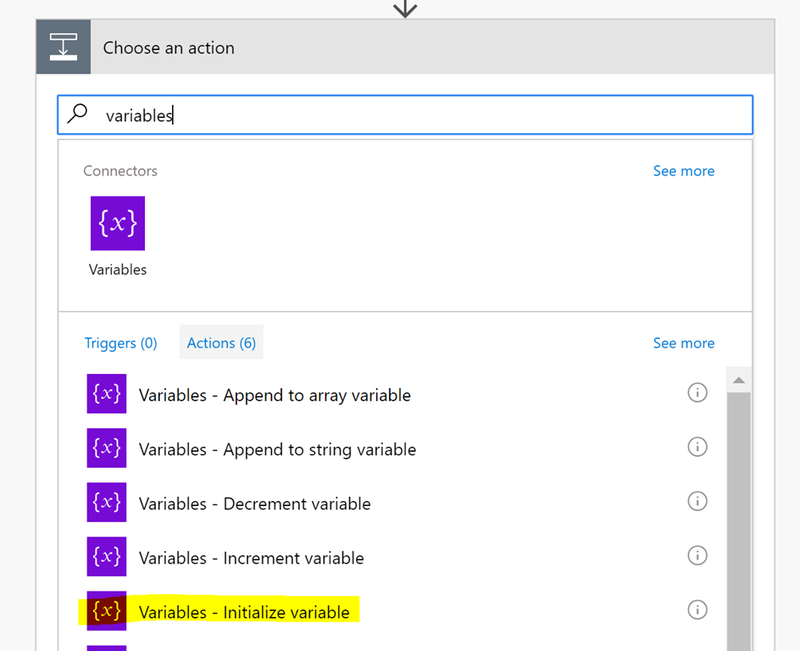 Trigger Azure Functions for running some code logic. 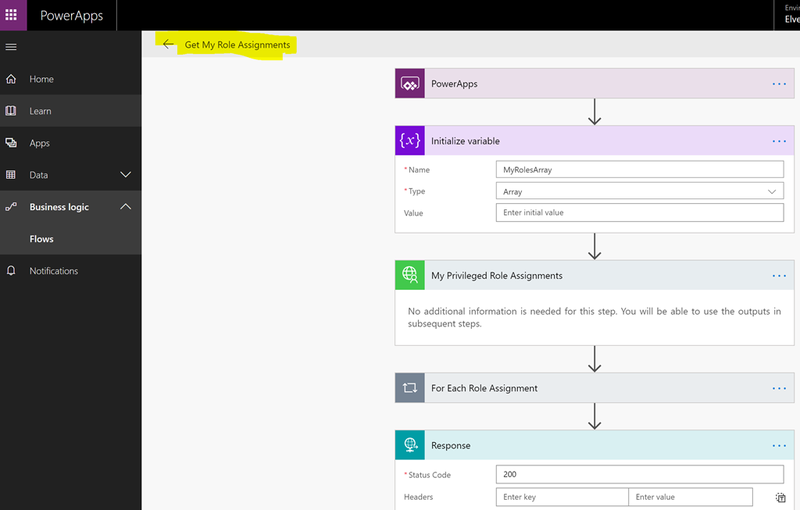 Trigger Logic App for executing a business flow logic. 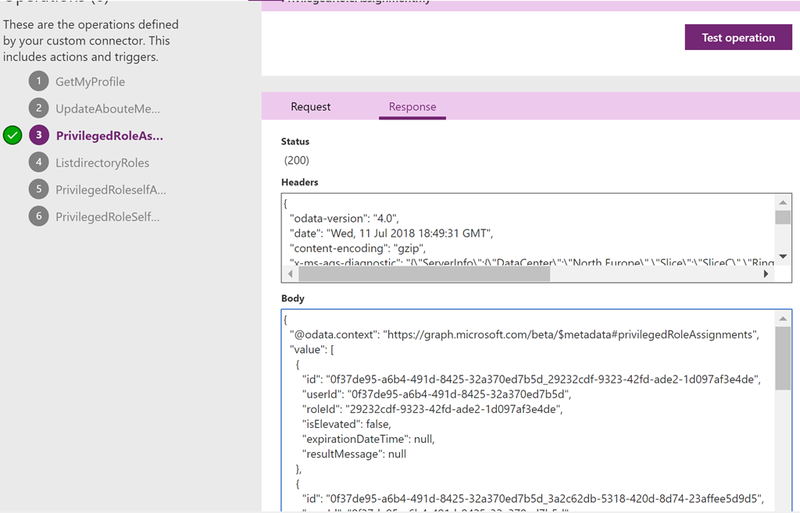 Trigger a webhook for posting a status, for example to a Microsoft Teams webhook. 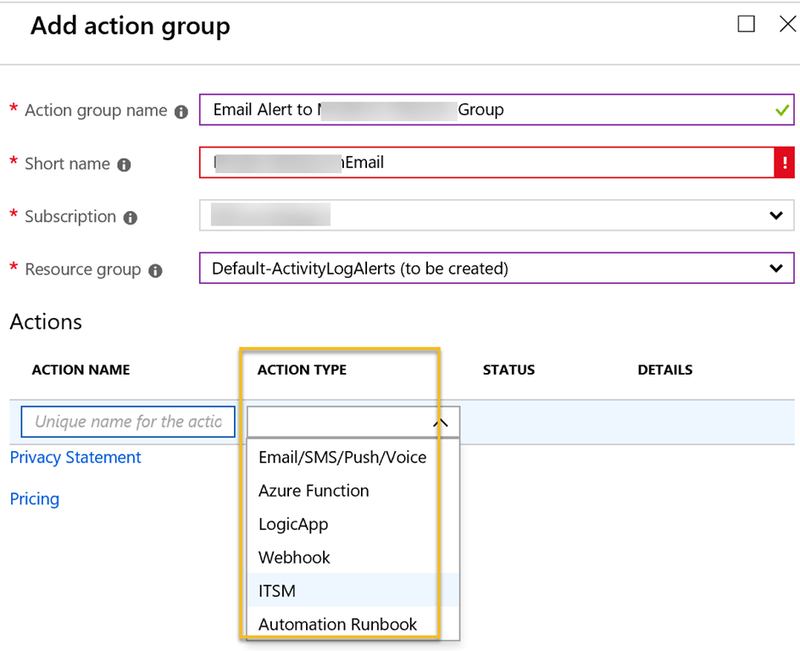 Send the Alert via ITSM connector to create an incident in your connected ITSM system. 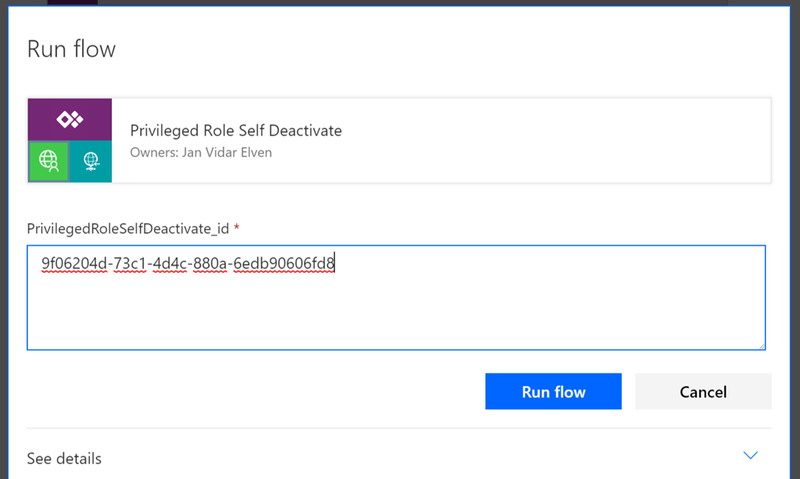 Trigger a Runbook in Azure Automation to run your own PowerShell runbooks, or you can use one of the built-in runbooks for restart, stop, remove or scale up/down VM. 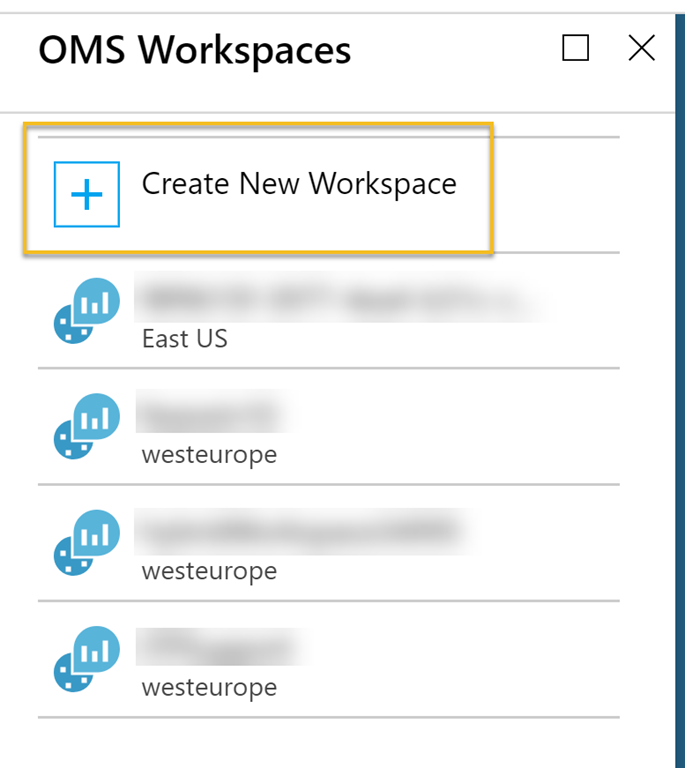 Thats it, now we can just wait for future Self-Service Password Reset or Change connectivity errors, and we will get notified. 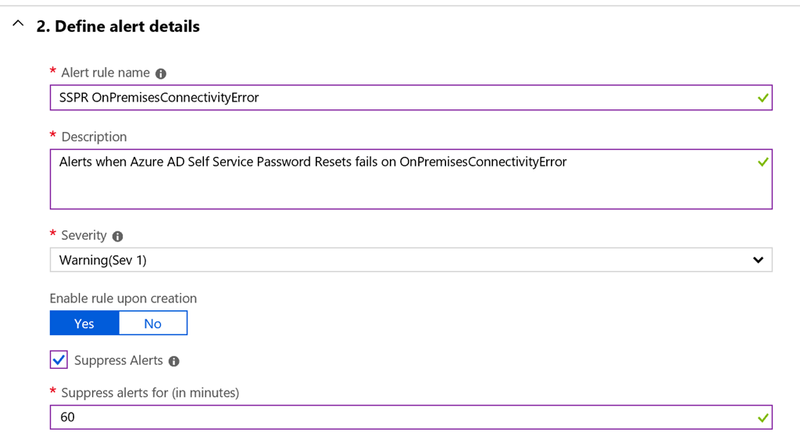 For testing, I just wanted to force the error by logging into my Azure AD Connect Server and stop the service. 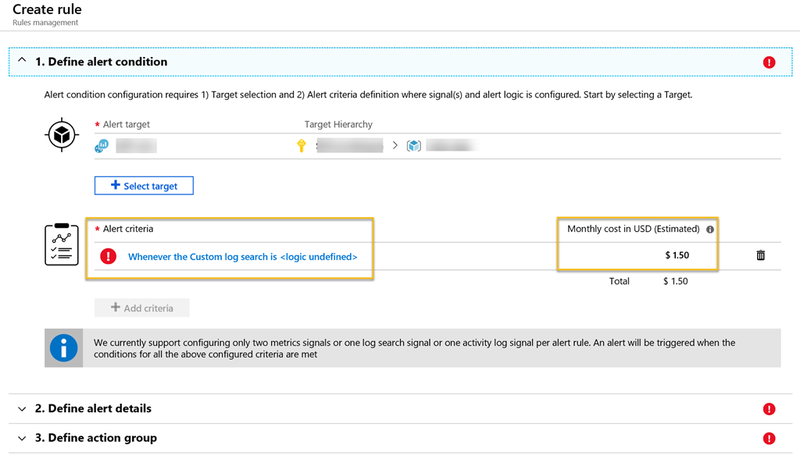 I don’t know about you, but I think this is just brilliant 🙂 With the integration of Azure AD Activity Logs in Log Analytics, I can really explore and analyze a lot of the operations going on in my tenant, and using Azure Monitor I can create alert rules that notifies or trigger other actions to handle those alerts. 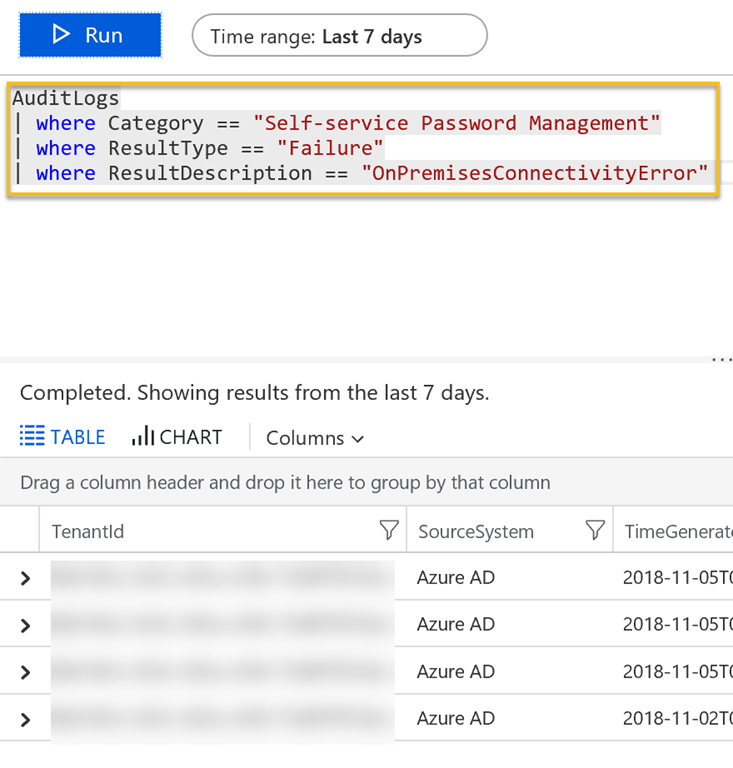 Thanks for reading, more blog post will follow on this subject of Azure AD and Log Analytics, so stay tuned! 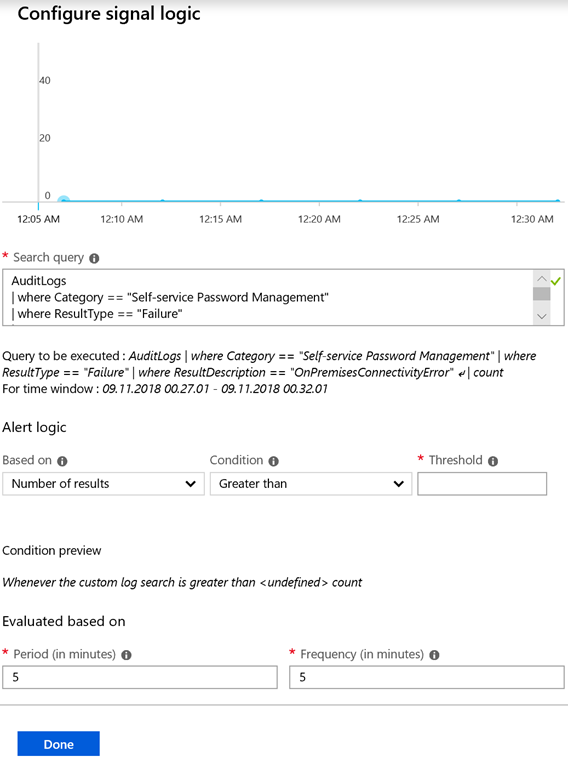 This entry was posted in Azure, Azure AD, Azure Monitor, Log Analytics, Self-Service Password Reset and tagged Azure AD, Azure Monitor, Log Analytics on November 11, 2018 by Jan Vidar Elven. 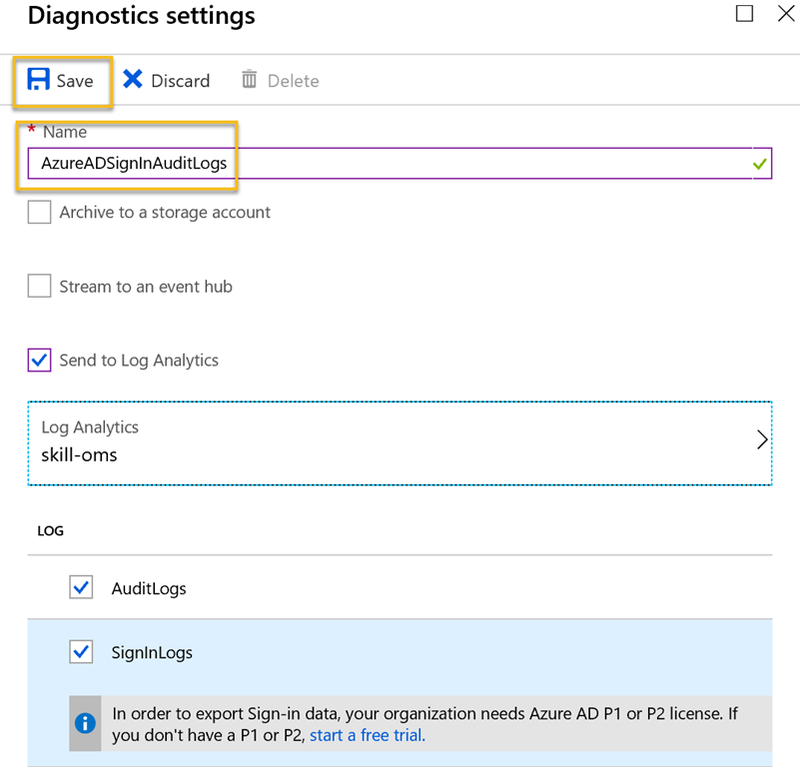 Recently Microsoft announced the availability of forwarding the Azure AD Activity Logs to Azure Log Analyctis. 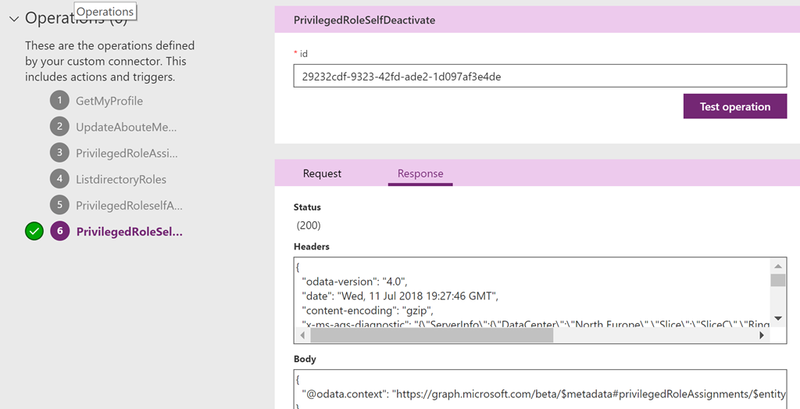 You can read the announcement in full here: https://techcommunity.microsoft.com/t5/Azure-Active-Directory-Identity/Azure-Active-Directory-Activity-logs-in-Azure-Log-Analytics-now/ba-p/274843. 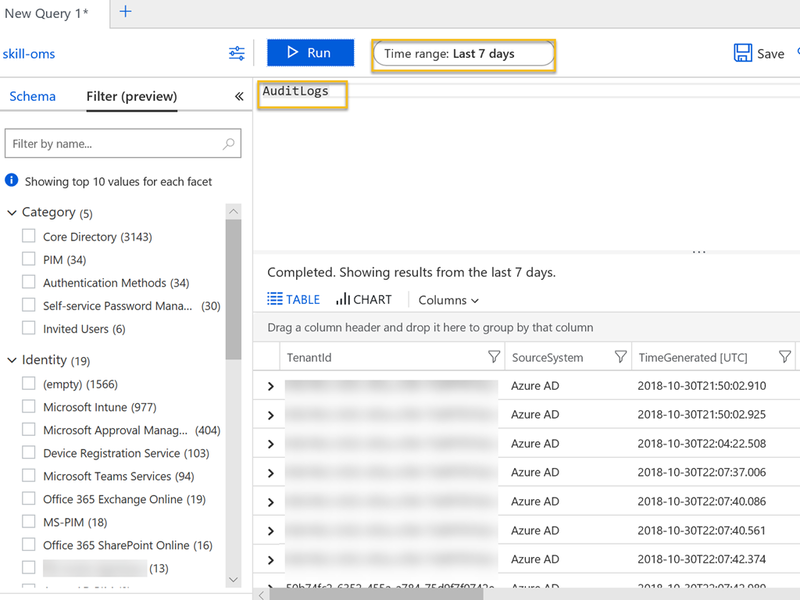 By bringing thousands (or even millions depending on your organization size and use of Azure AD), of sign-in and audit log events to Log Analytics you can finally use the power of Log Analytics for query, analyze, visualize and alert on your data. 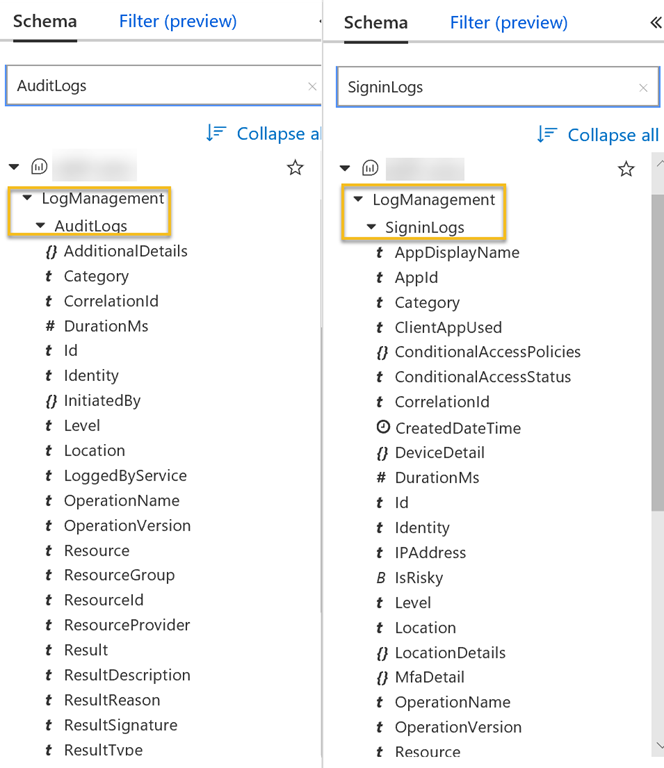 Next select to Send to Log Analytics, and then select either or both of the AuditLogs or SigninLogs. 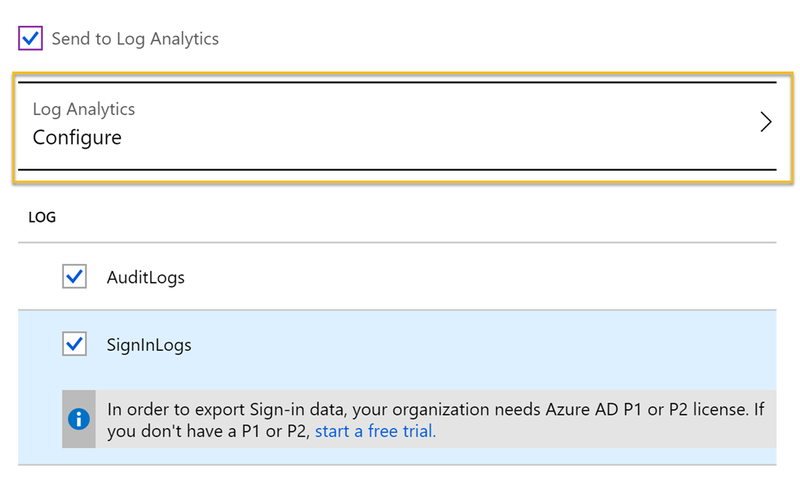 Note that to be able to export Sign-in data, your organization needs Azure AD Premium P1 or P2 (or EMS E3/E5). 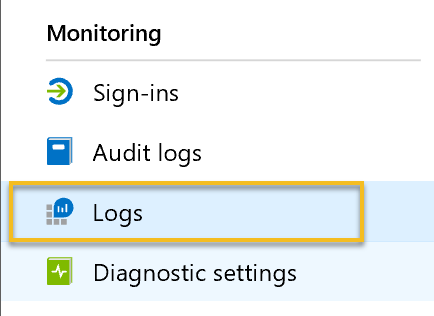 This requirement only applies to sign-in logs, not audit logs. Important info! 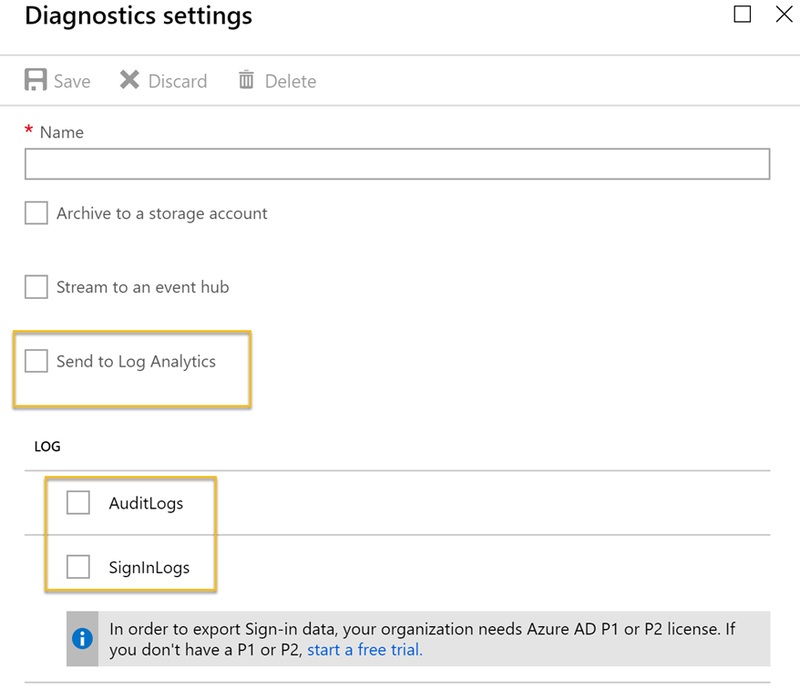 Usually you will need to be a Global Administrator or Security Administrator to be able to access the details of Sign-in logs or Audit logs in Azure AD, but by exporting this data to either an existing or a new Log Analytics workspace, potentially a lot more users can access that data. 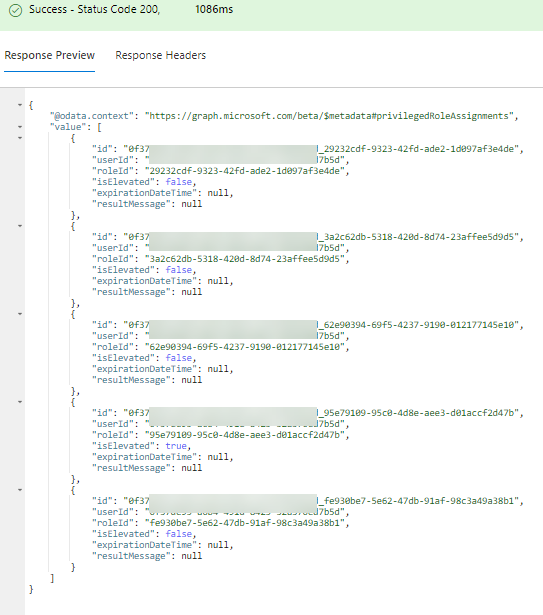 You need to think about if this is something you want to do, and at least control and govern which users can access that Log Analytics workspace. 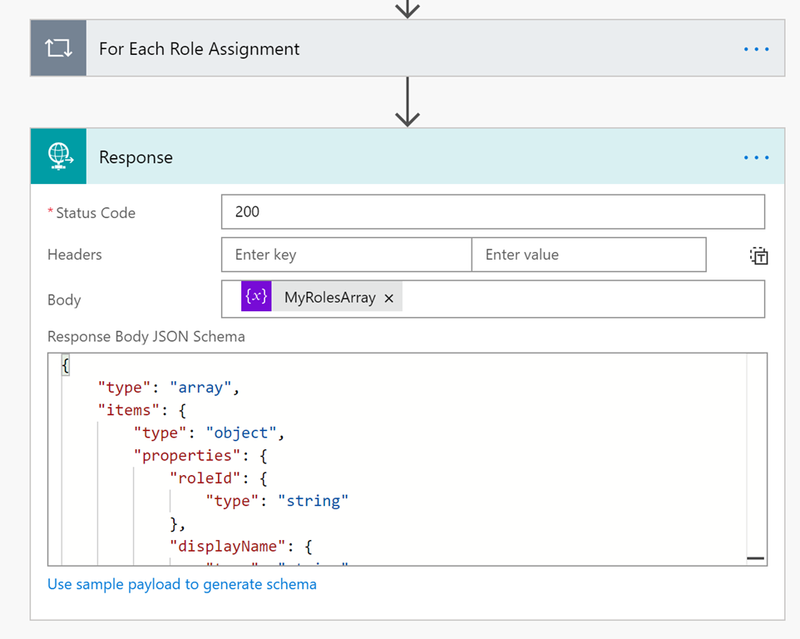 | where (DataType == "SigninLogs" or DataType == "AuditLogs") and Solution == "LogManagement"
Choosing a pricing tier depends on whether the Subscription was created before April 2, 2018 or not, or whether you have elected to move to a new pricing model. The older pricing model had a choice of free tier, which had a daily cap of 500 MB and a data retention of 7 days. As the diagram above showed, most organizations will be way below the 500 MB daily cap, but a retention of only 7 days will be considered short for most analyzing needs. So under the older pricing model you would consider a standalone per GB model, giving a retention of 1 month by default, but a cost of $2.30 per GB. The new pricing model after April 2, 2018 has a simplified pricing model. Here the first 5 GB are free and you have a default retention of 31 days. Additional GBs for ingestion are $2.99 per month, and extra retention after the first 31 days is $0.13 per GB per month. 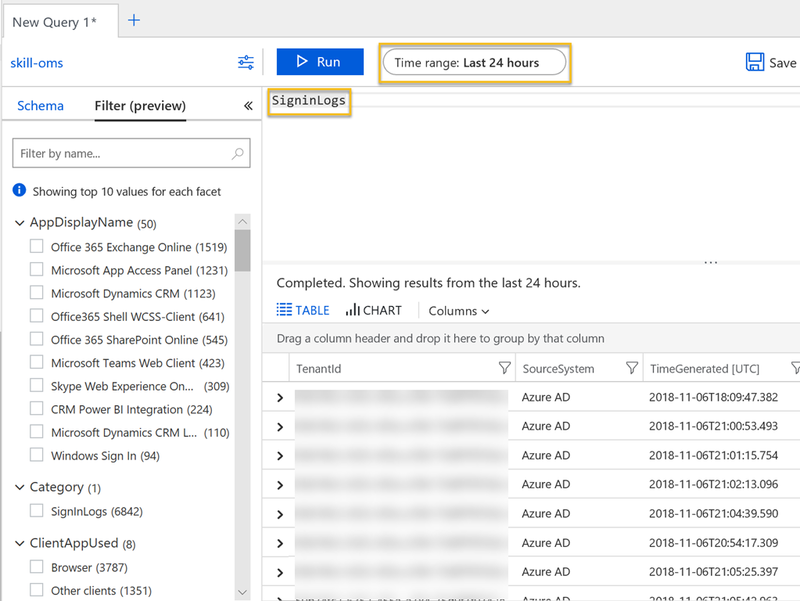 Note that this pricing model is on subscription level and affects all your Log Analytics workspaces, so you need to carefully consider any changes to the new pricing model in your subscription. 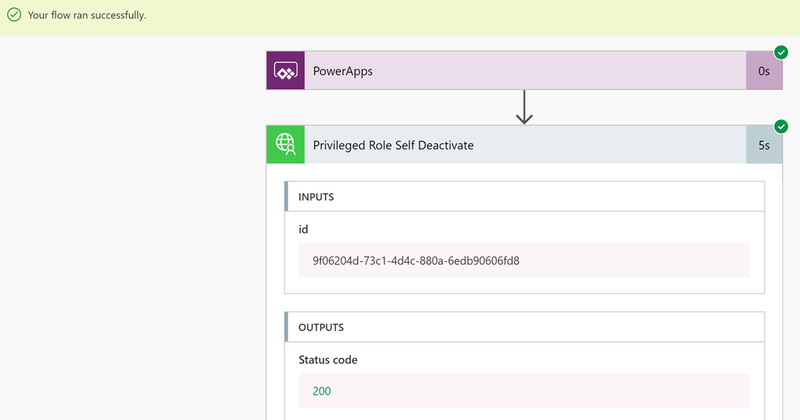 After about 15 minutes you can start explore the Logs in the Log Analytics workspace. 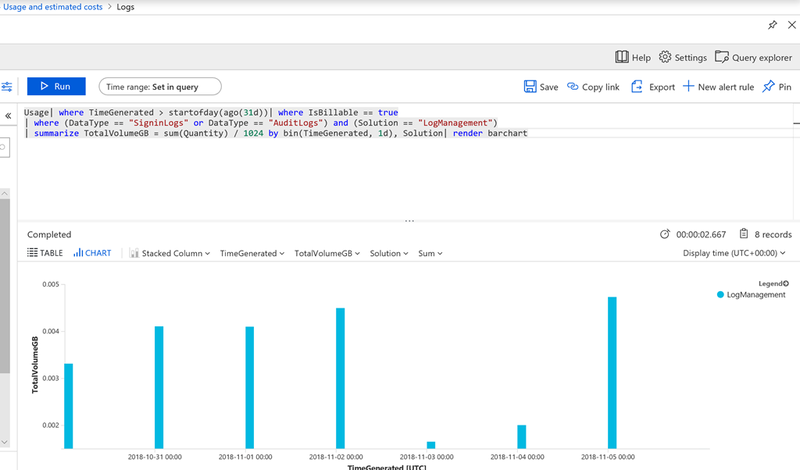 By default this will open a search query showing sample data from all your Log Analytics workspace. 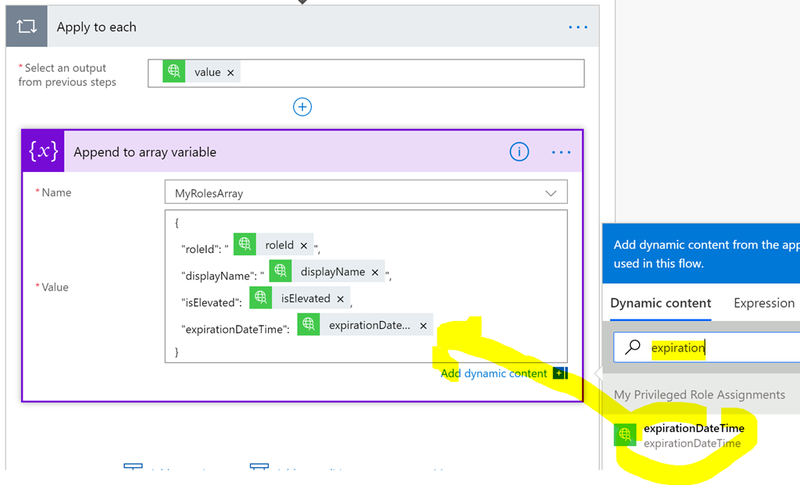 Depending on your sample data you can start filter on the left side, for example to look at only certain app sign ins, or client apps used, location and more..
See the links in the beginning of this blog post for some more sample queries and you can also import some sample views. 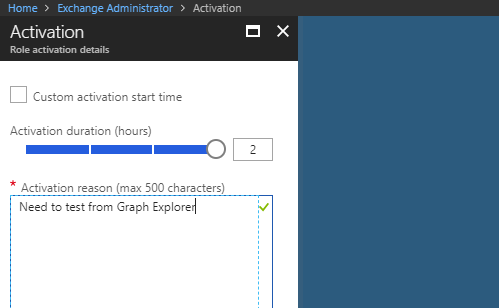 So now that we have a working diagnostic setting that exports my Azure AD sign-in and audit logs to Azure Log Analytics, I’m ready to explore some interesting scenarios for analyzing this data. This will be a topic for upcoming blog posts, so stay tuned for that! Thanks for reading so far, I’m really excited for this feature! 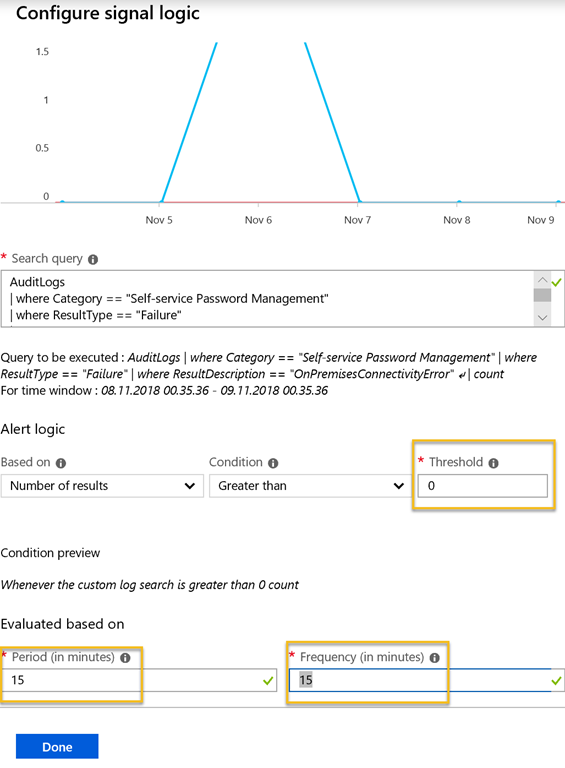 This entry was posted in Azure AD, Azure Monitor, Log Analytics and tagged Azure AD, Azure Monitor, Log Analytics on November 6, 2018 by Jan Vidar Elven. 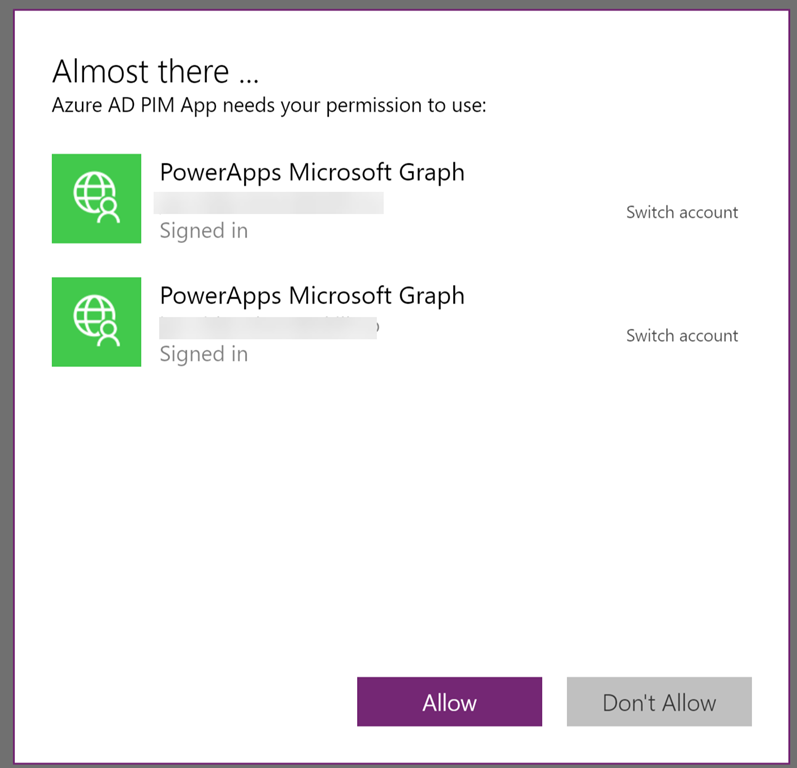 Just recently I published a blog post on how to use PowerApps and Flow with a custom connector using Microsoft Graph API, to create an app for Azure AD PIM (Privileged Identity Management): https://gotoguy.blog/2018/09/15/create-your-own-azure-ad-pim-app-with-powerapps-and-flow-using-microsoft-graph/. 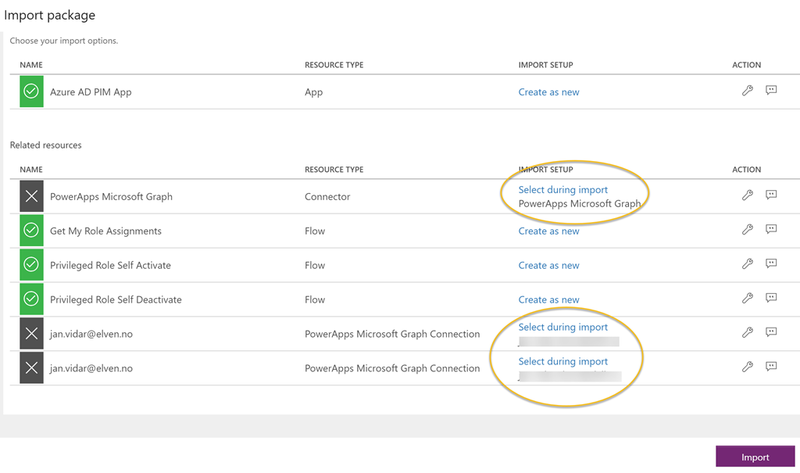 In this blog post I want to share some instructions and experiences on exporting the PowerApp and Flows to a package, and how you can export the Custom Connector definitions to a swagger file. 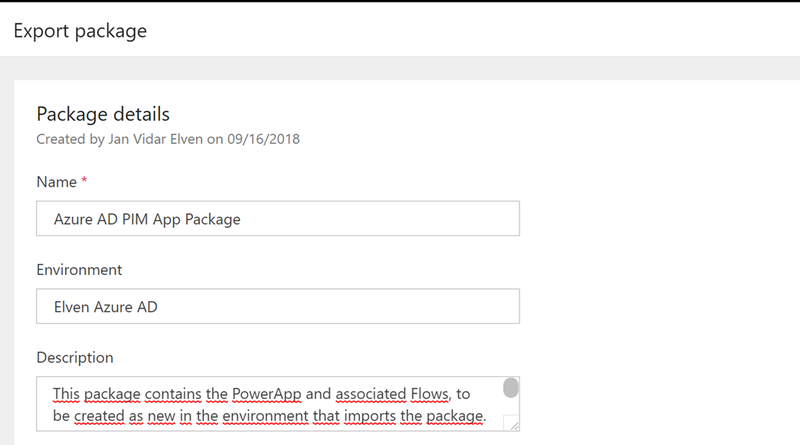 After that I will show how you in a new environment can import these definitions, and import the PowerApp and Flow package. 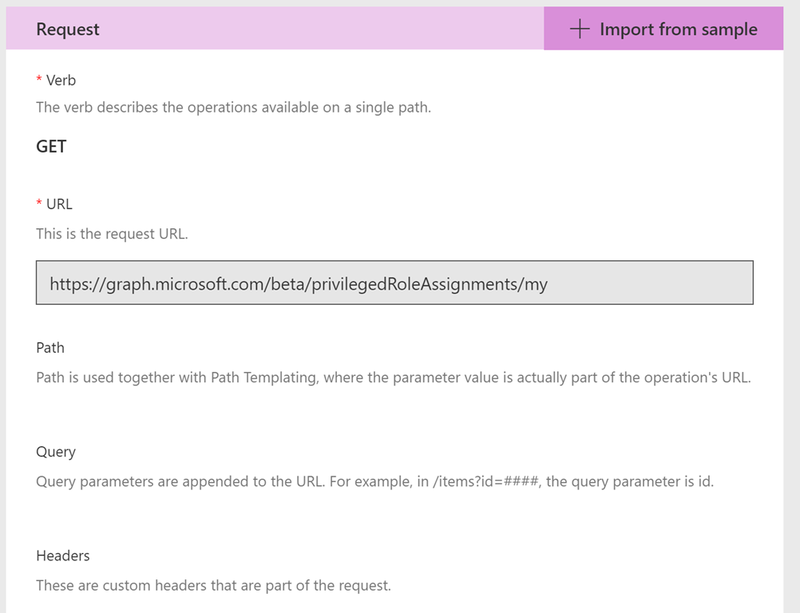 Even better, based on the aforementioned blog post on the Azure AD PIM App, I will provide you with download links for the custom connector swagger defininiton for Microsoft Graph, as well as the PowerApp and Flows Package, so you can start from there without having to build all the stuff yourselves ! 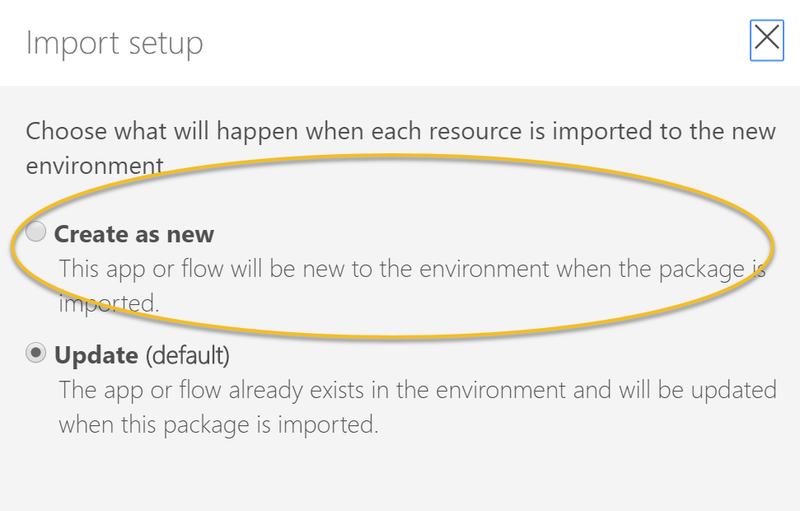 For some of the resources you can select between Create as new or Update, and as I’m planning to import this as a new App with new Flows in the environment, I’ll change this from the default. 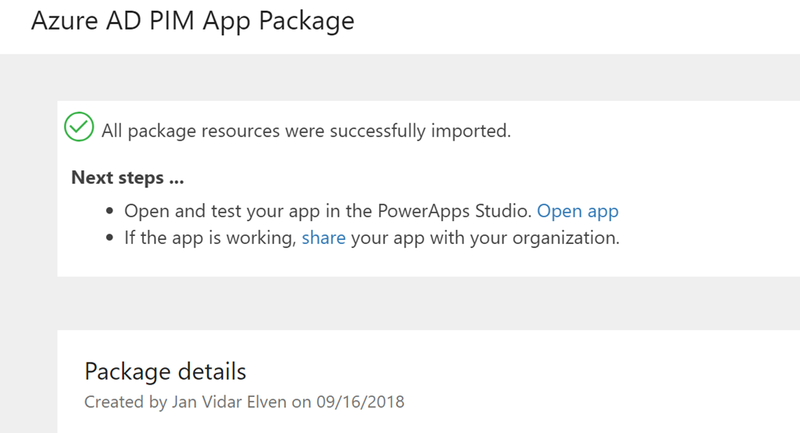 The other resources (like the connector and connections) I will select during import. 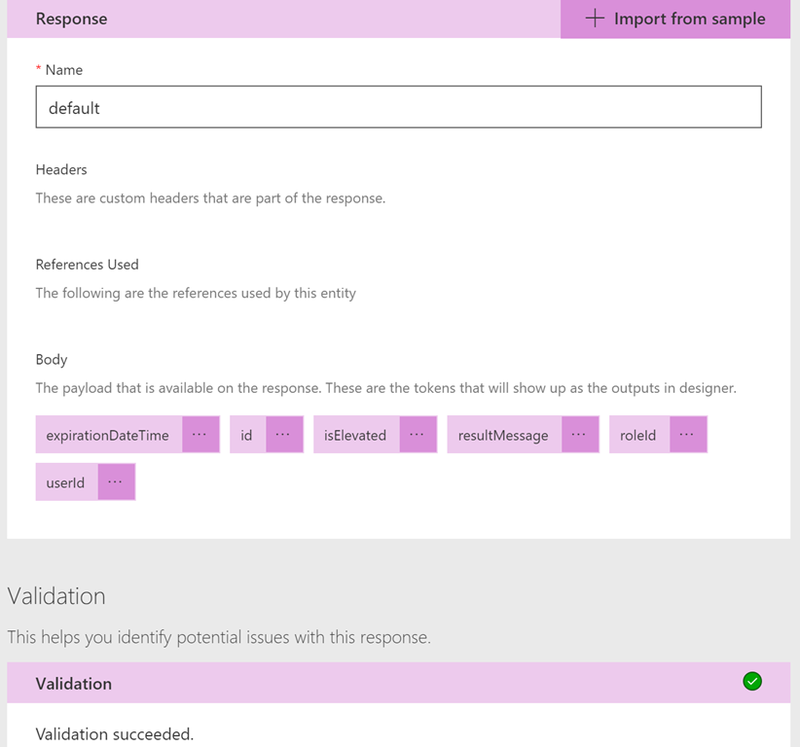 This means these will have to be already existing in the environment I want to import the package to. Courtesy of gotoguy.blog, I’ll provide you with a download for both the PowerApps/Flows package, as well as the Custom Connector Swagger JSON file. 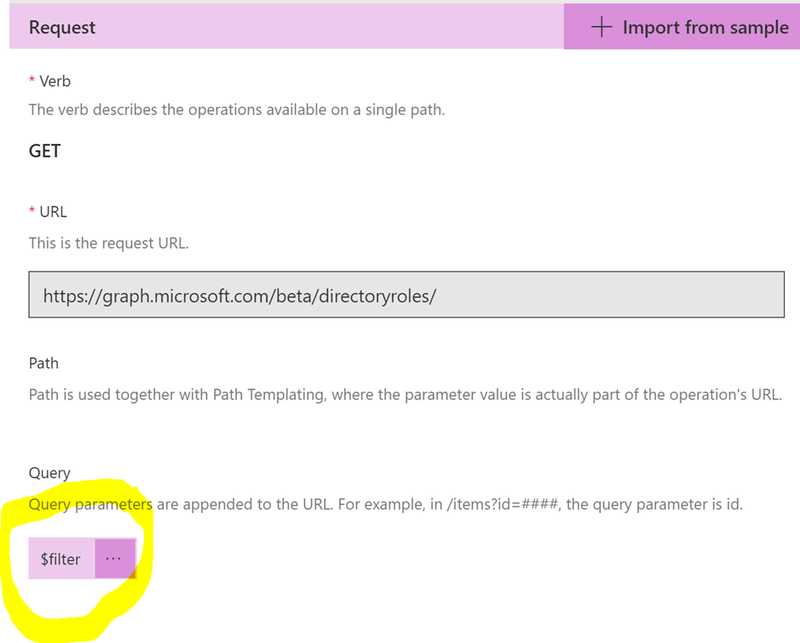 This is helpful if you want to skip right ahead to the next Import section. 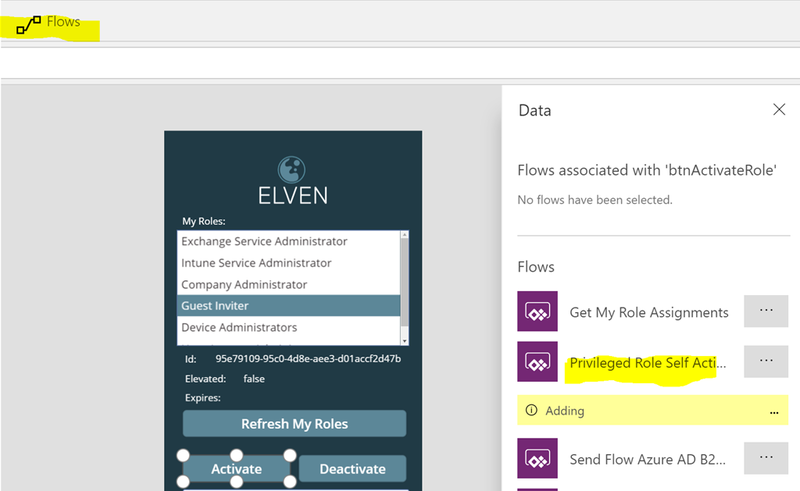 https://github.com/skillriver/PowerAppsFlowCustomConnector. 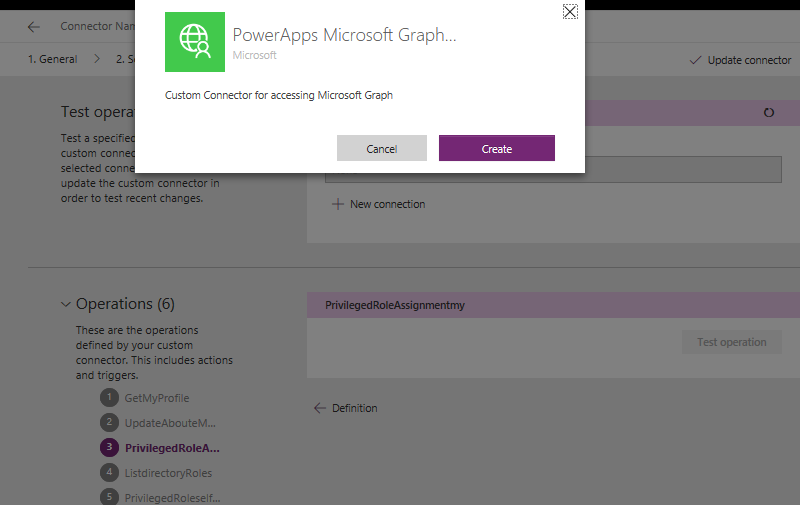 Under the folder MicrosoftGraphApi you will find an always updated version of my PowerApps Microsoft Graph custom connector operations. 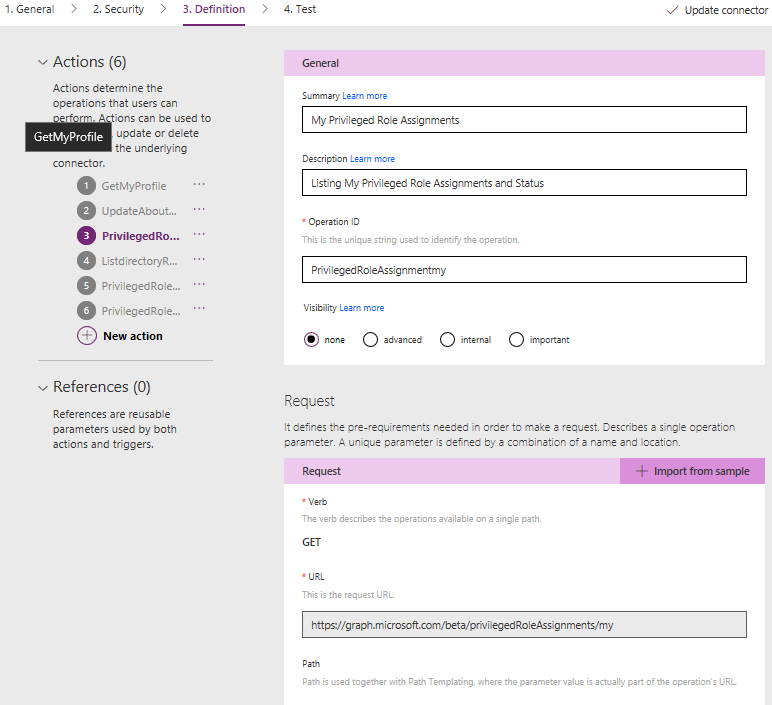 Look to the Readme.md file for details. PS! 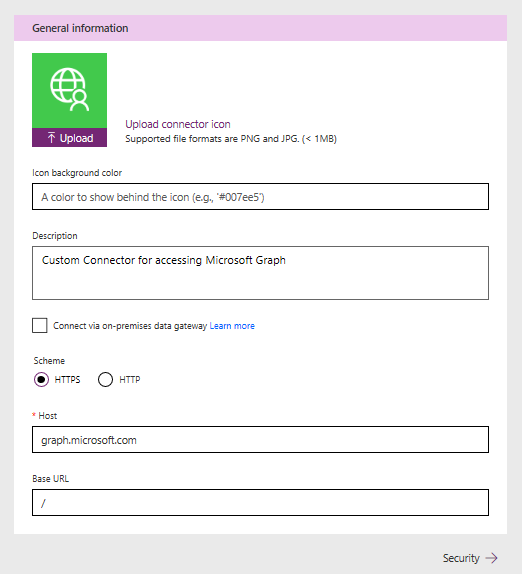 I will add more operations to this connector later, and the file will be updated. 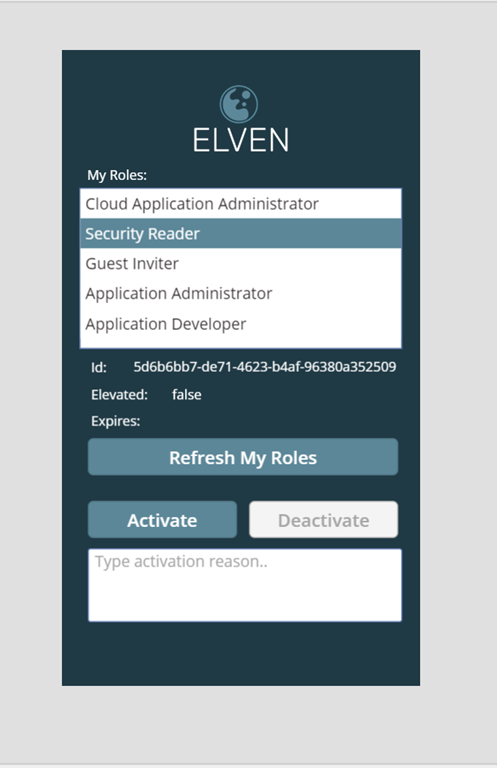 https://github.com/skillriver/PowerAppsFlowPackage. 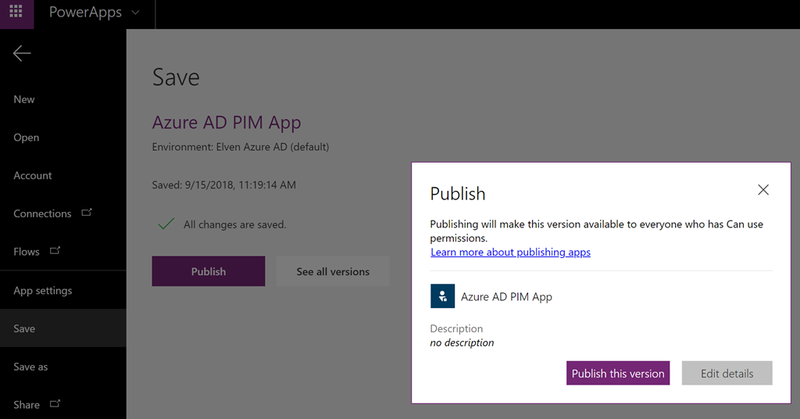 Under the folder AzureADPIMApp you will find the previously exported PowerApp and Flows for the Azure AD PIM App. 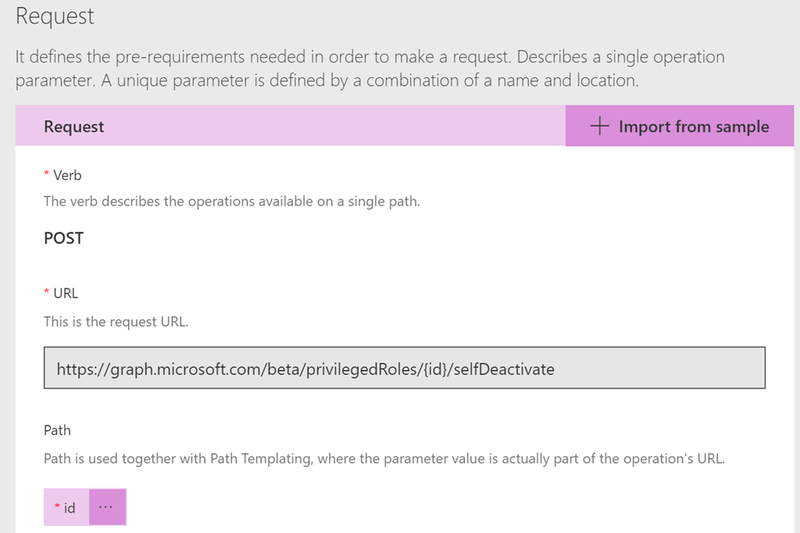 See readme.md file for details. 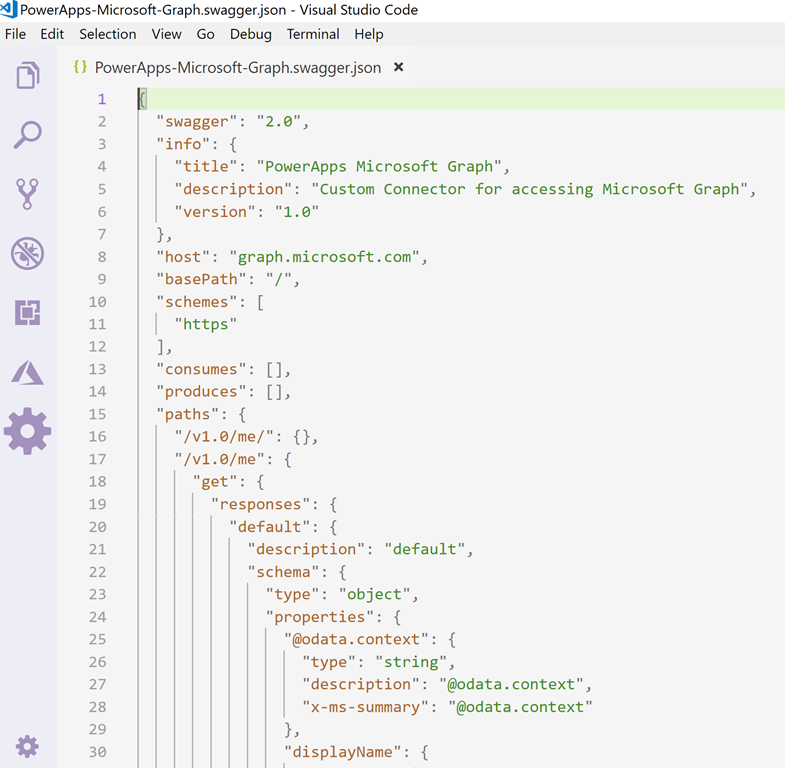 Remember that to be able to use a Custom Connector and Microsoft Graph, you will have to create or use an App Registration in Azure AD in your target enviroment, like I have described in this blog article, under the section “App Registration”: https://gotoguy.blog/2017/12/17/access-microsoft-graph-api-using-custom-connector-in-powerapps-and-flows/. Verify the URL and click Continue. Click to go to the next Definition page. After testing this the custom connector is ready to use. 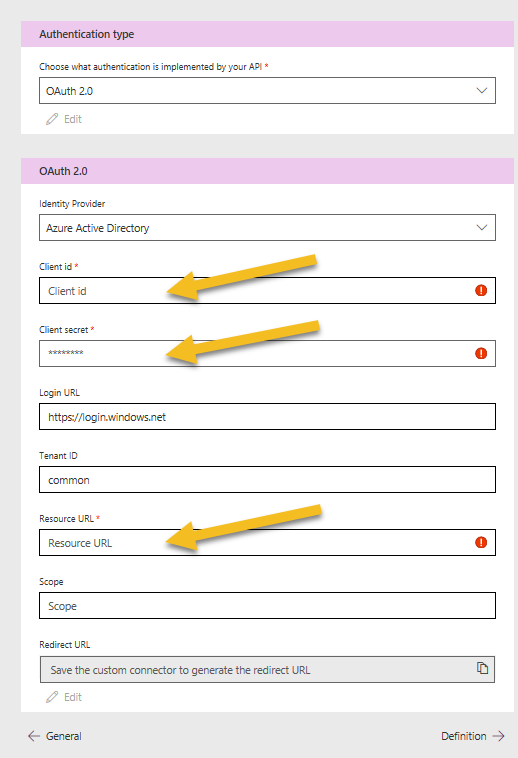 If you don’t have the original secret stored securely somewhere, you have to go to the App Registration in Azure AD and generate a new one. 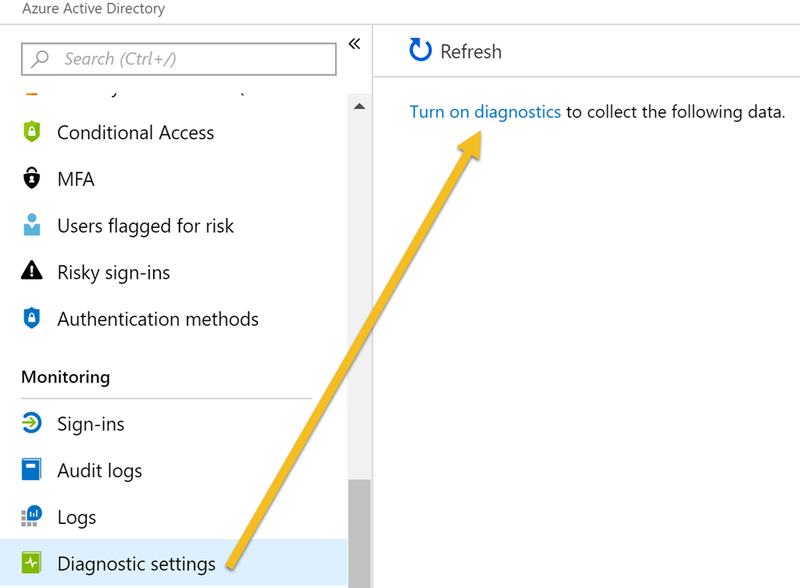 Click Update Connector to save the changes. 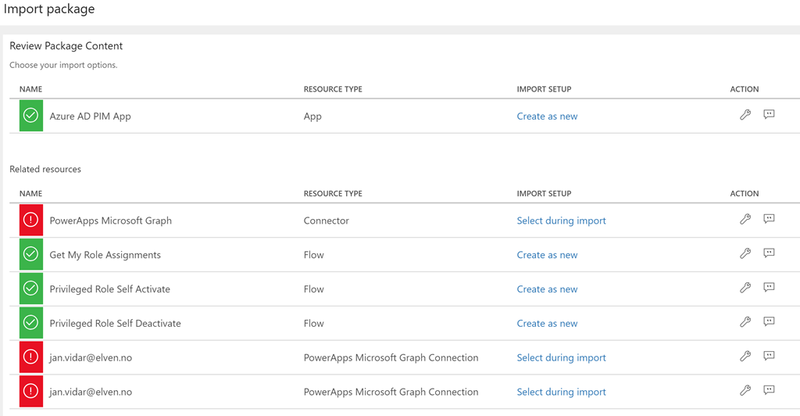 Now we are ready import the PowerApp and the Flows that will use this custom connector. 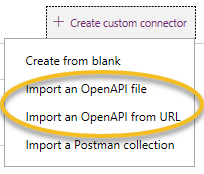 We can now import the package we exported earlier, or if you want to use the community download from my GitHub repository, make sure that you download the zip package before this next step. 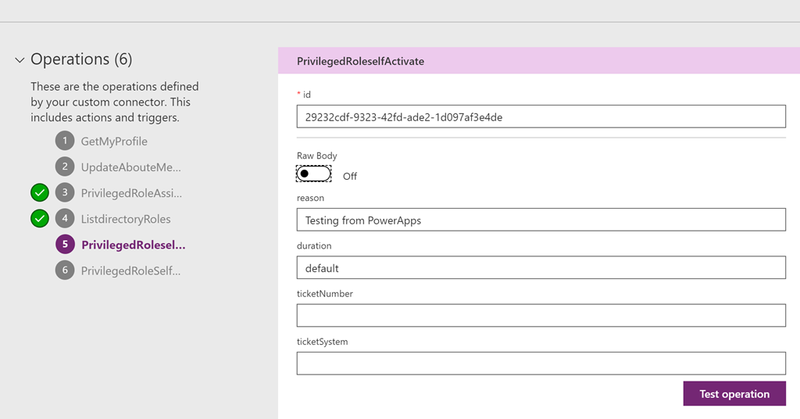 Note that you also can change the name of the PowerApp and Flows by clicking on the wrench symbol. 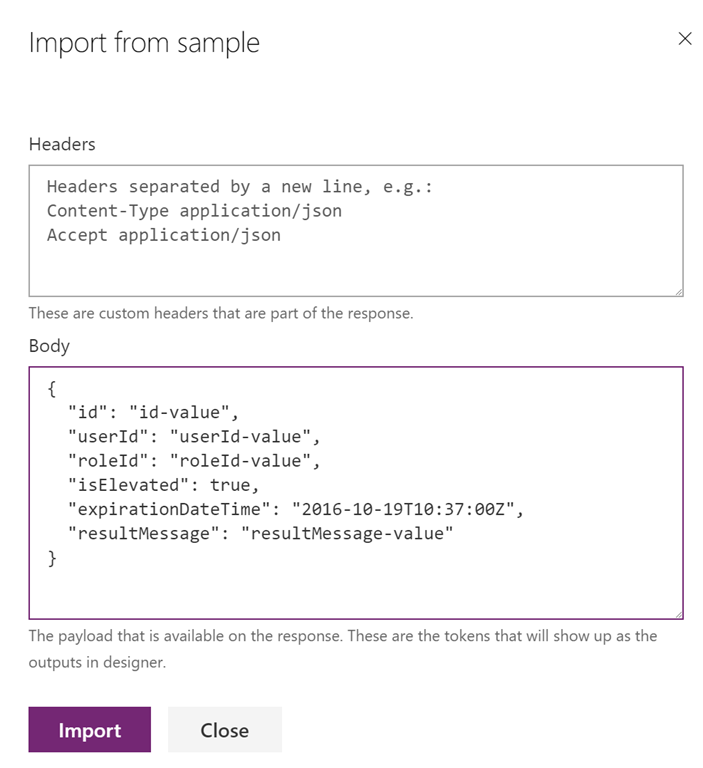 With that I can conclude this blog post, we have been able to export the custom connector definition and the PowerApps package including the Flows, and import these into a new environment. 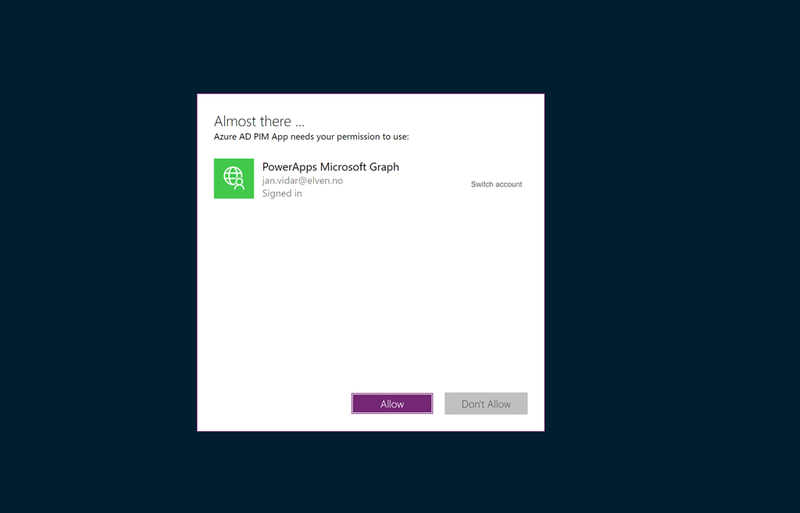 Now all that is left is to publish and share the PowerApp to be used in your organization. Thanks for reading, hope it has been helpful! 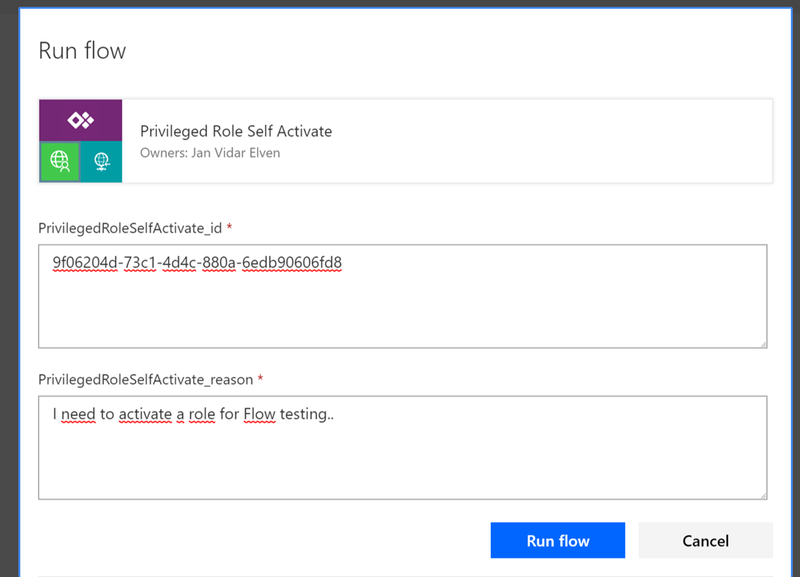 This entry was posted in Azure AD, Azure AD Privileged Identity Management, Microsoft Flow, Microsoft Graph, PowerApps and tagged Microsoft Flow, Microsoft Graph, PowerApps on September 19, 2018 by Jan Vidar Elven. 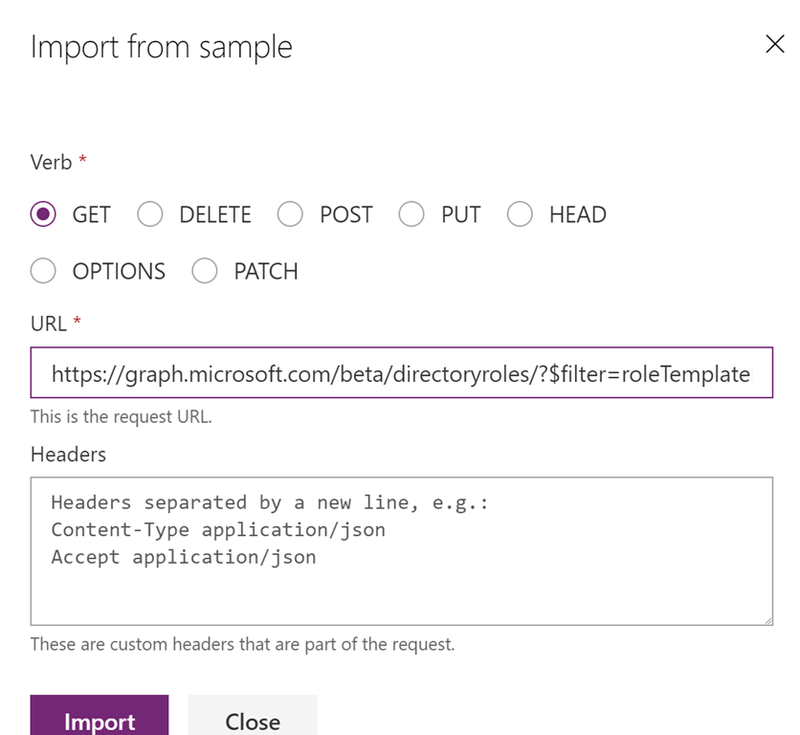 A while back I wrote a blog post on how you could access Microsoft Graph API using a custom connector in PowerApps and Flows: https://gotoguy.blog/2017/12/17/access-microsoft-graph-api-using-custom-connector-in-powerapps-and-flows/. 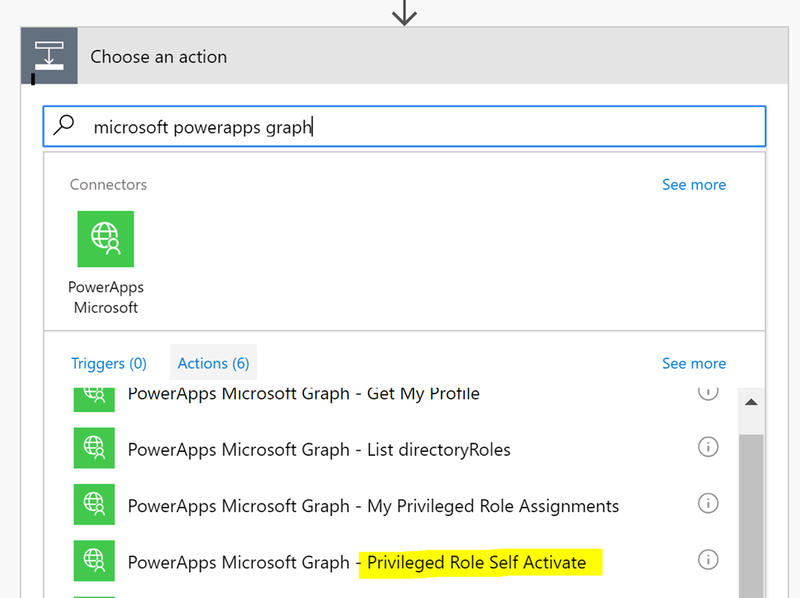 In this blog article I will build on that blog post to provide a practical example of using Microsoft Graph, and create an Azure AD PIM (Privileged Identity Management) App for activating any eligible admin roles for the logged on user. First lets look into some of the documentation and what we need to prepare. 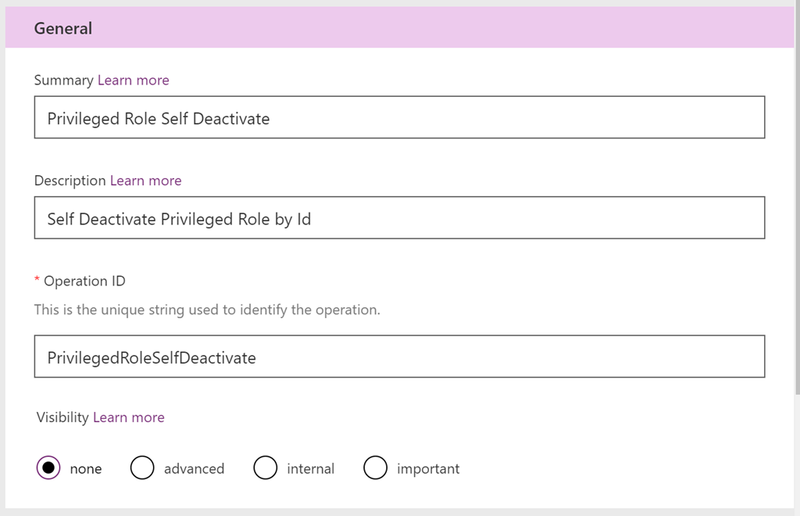 Azure AD Privileged Identity Management provides you a way to enable on-demand time limited access for administrative roles. 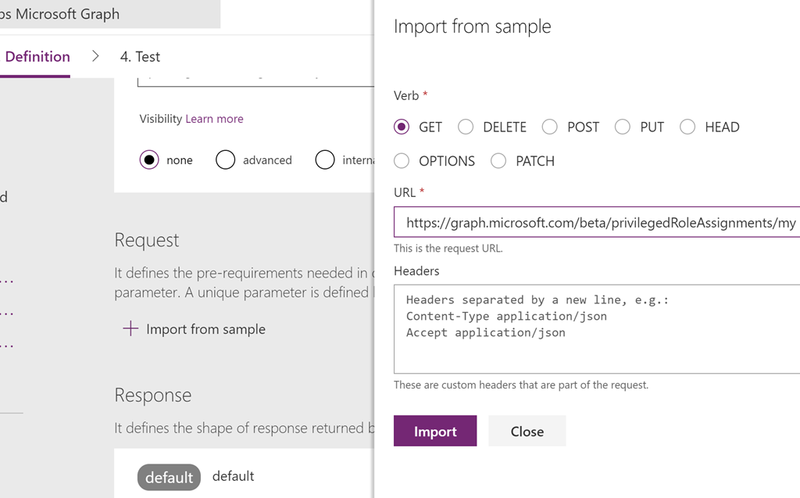 Microsoft Graph API for Azure AD PIM is currently available under the Beta endpoint, and documented here: https://developer.microsoft.com/en-us/graph/docs/api-reference/beta/resources/privilegedidentitymanagement_root. 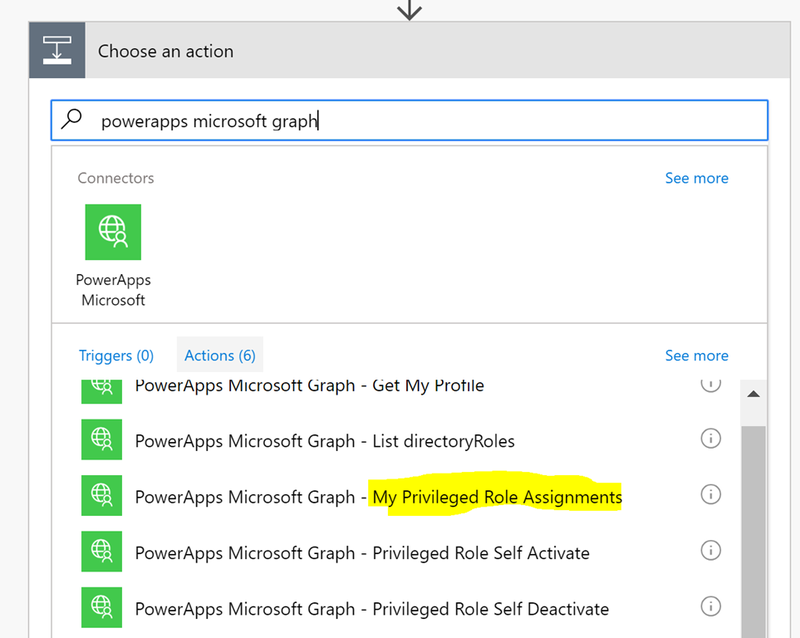 If I want to access my roles using Graph API I can use the privilegedRoleAssignment: my method (https://developer.microsoft.com/en-us/graph/docs/api-reference/beta/api/privilegedroleassignment_my). 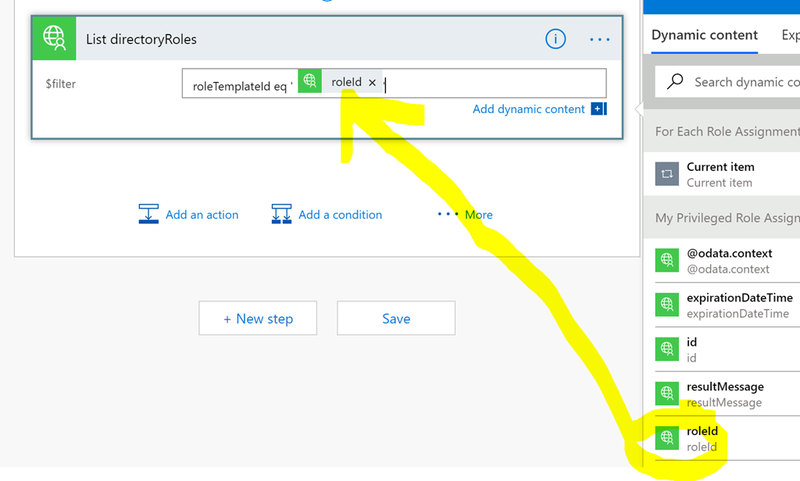 When my role assignments are returned I only get roleId’s though, so lets look at how I can get the displaynames of those roles. 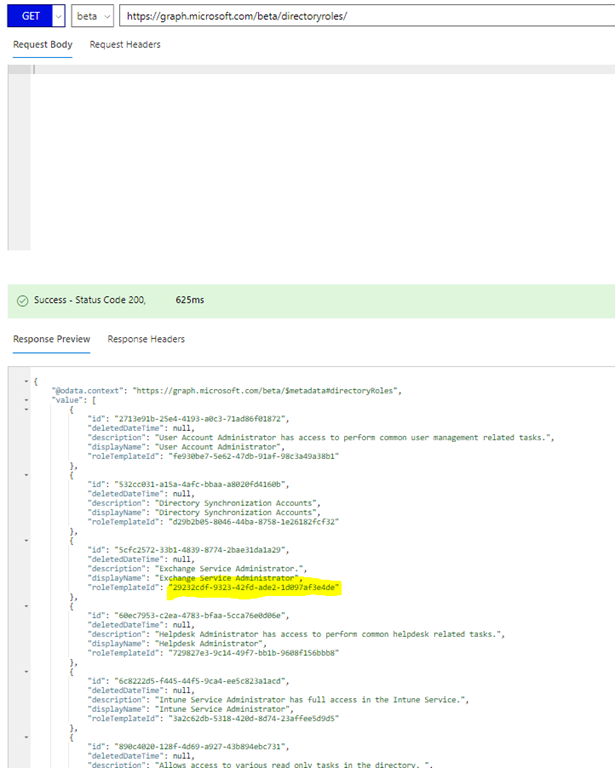 For example, I see from the response above that one of the roleId’s returned is 29232cdf-9323-42fd-ade2-1d097af3e4de. 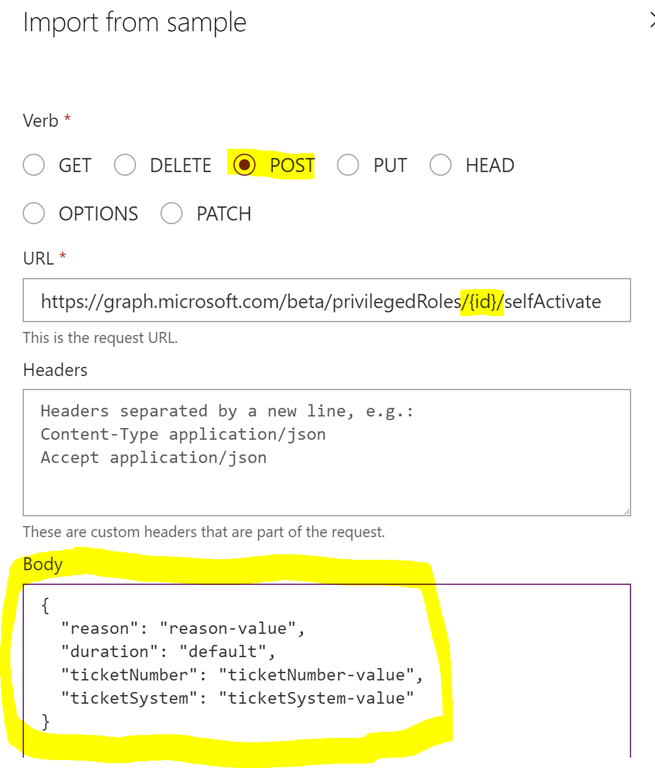 In the Graph API for Azure AD PIM there is a method to list privilegedRoles (https://developer.microsoft.com/en-us/graph/docs/api-reference/beta/api/privilegedrole_list), so if I run the following in Graph Explorer: https://graph.microsoft.com/beta/privilegedroles/29232cdf-9323-42fd-ade2-1d097af3e4de, I should get more role information right? 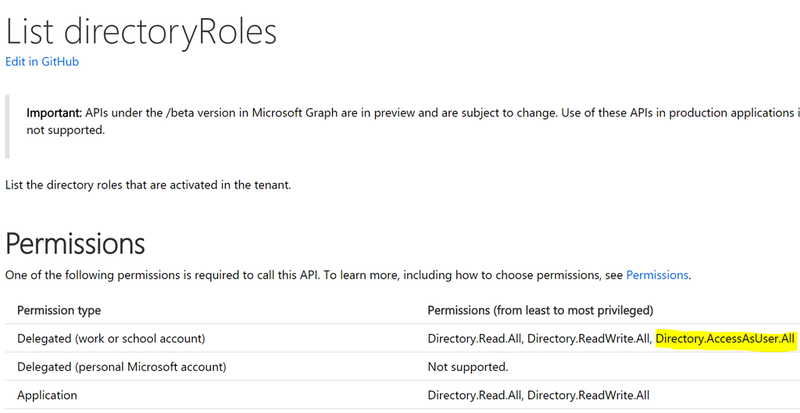 So that won’t work for me, as I want to let normal user accounts to be able to use my Graph API commands. 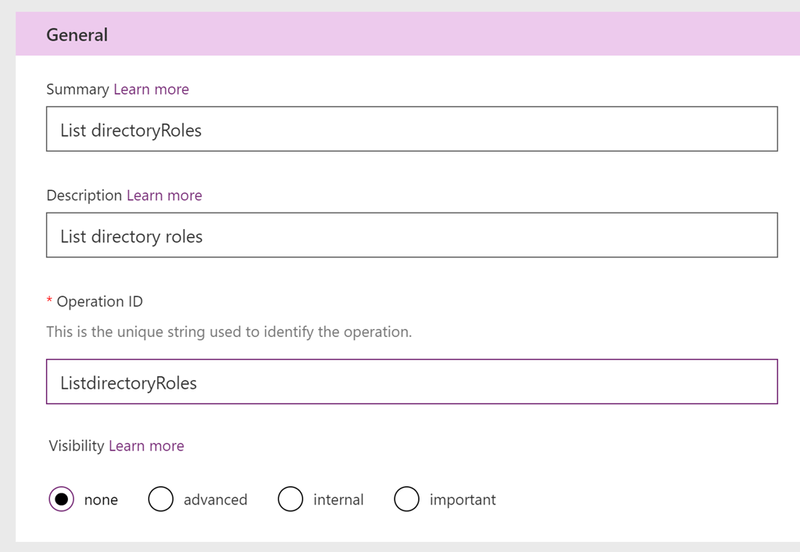 Ok, so now I have a way to query for my role assignments, and also a way to query for the display names of any roles. 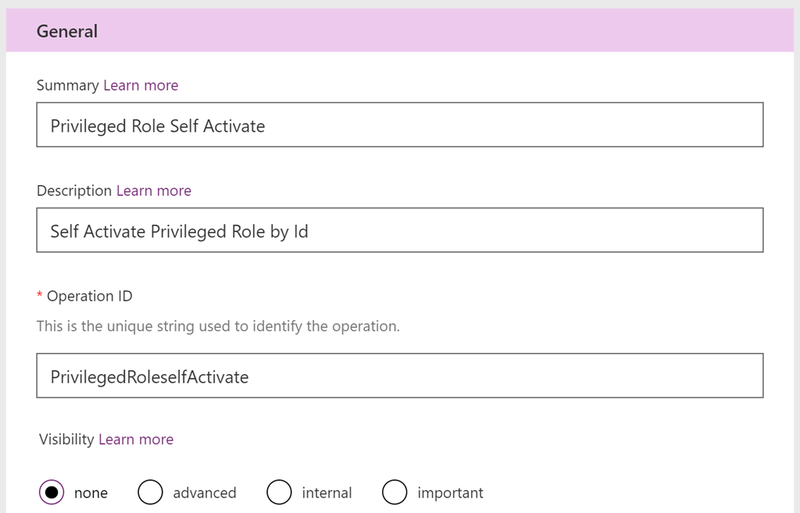 Now I need to see how I can activate (or deactivate) my role assignments. 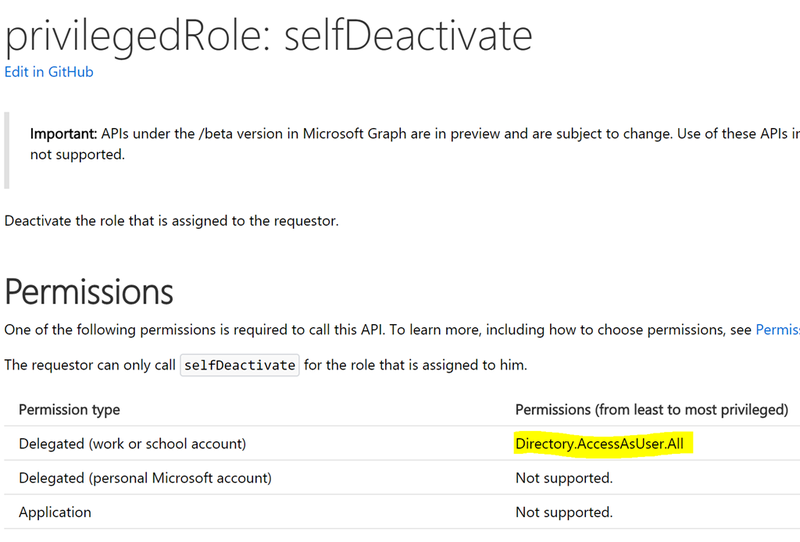 I will use these methods: privilegedRole: selfActivate and privilegedRole: selfDeactivate, they are documented at https://developer.microsoft.com/en-us/graph/docs/api-reference/beta/api/privilegedrole_selfactivate / https://developer.microsoft.com/en-us/graph/docs/api-reference/beta/api/privilegedrole_selfdeactivate. 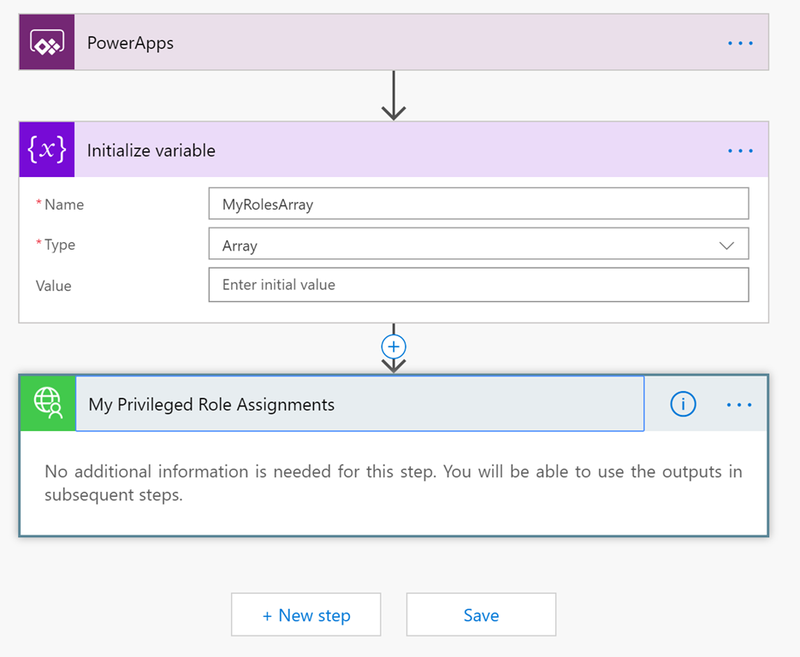 I think these 4 methods will do for now, there are a lot of other methods for managing PIM roles and settings as well, but we are now ready to start working with our PowerApps and Flow Custom Connector. 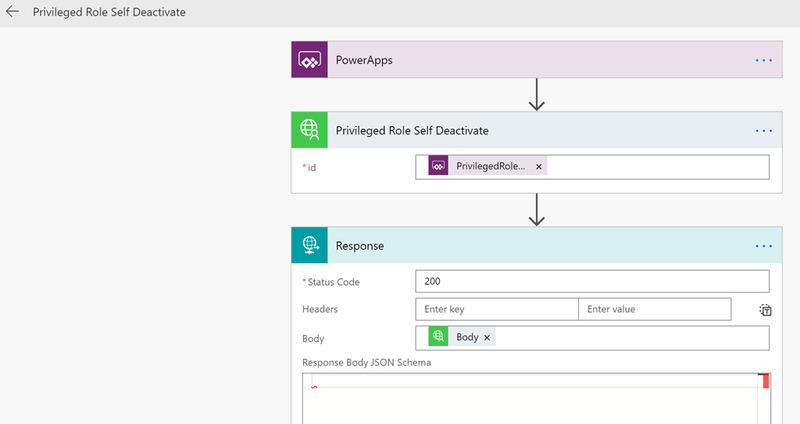 As I mentioned in the beginning of this blog post, I previously wrote a blog post on how to set up an App Registration for a custom connector for PowerApps and Flows. 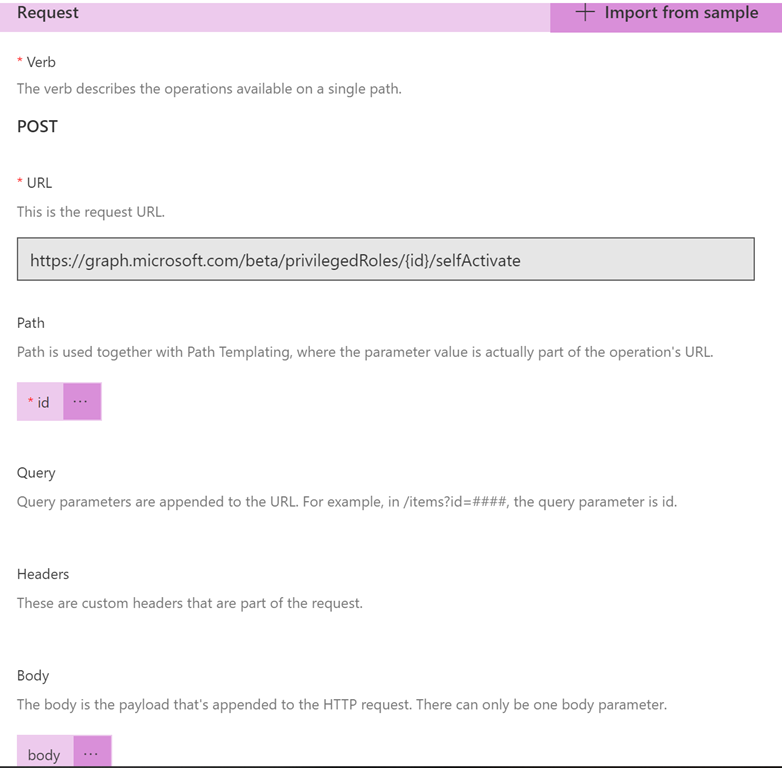 I will now build on this, so if you want to follow the steps I do here, please set up the prerequisites as described in the blog post: https://gotoguy.blog/2017/12/17/access-microsoft-graph-api-using-custom-connector-in-powerapps-and-flows/. 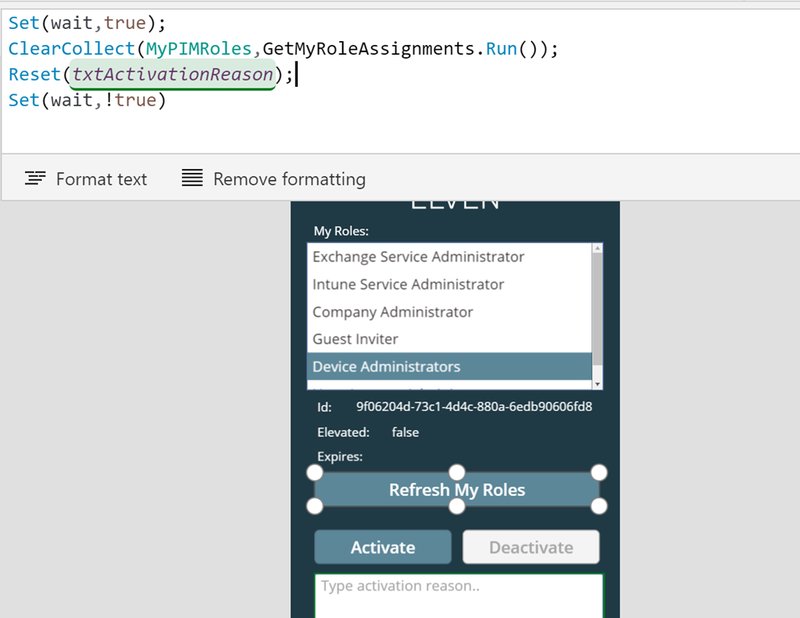 Now we are ready to add the PIM API methods to the Custom Connector. If you don’t have it, just follow the steps in the linked post to create it. 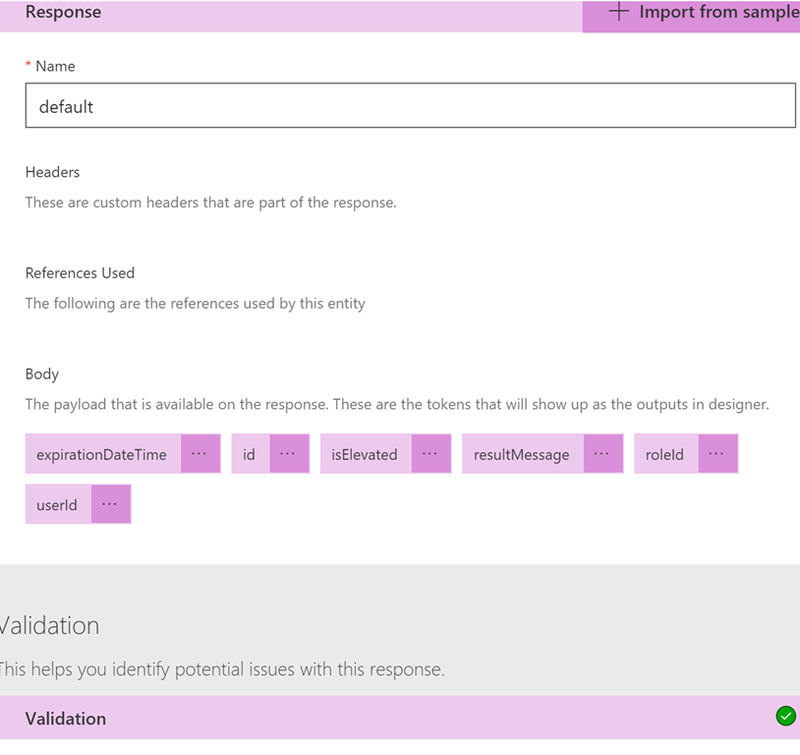 This response will help the custom connector operation so that we can get the right output values mapped in our PowerApp later. Select Import. 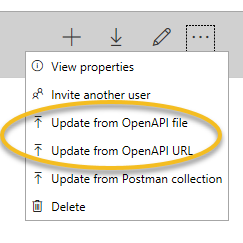 Click on Update connector to save this operation, do not select to Test at this point. 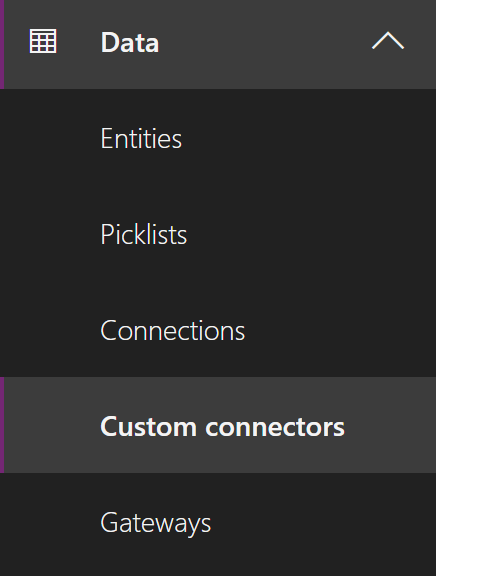 We have more to do..
Now that we have the Custom Connector Operations ready, we can proceed to create the PowerApp. 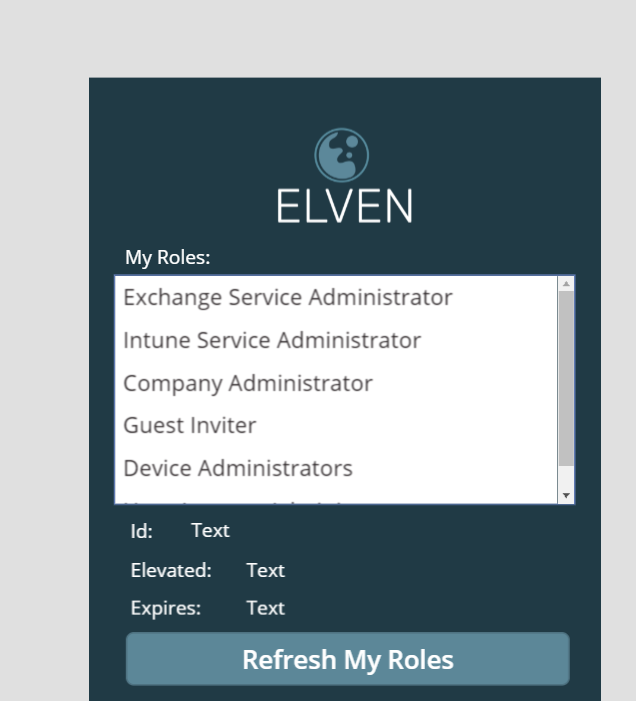 We’ll begin with an empty app, create some controls and layouts before we get into the Flows needed. 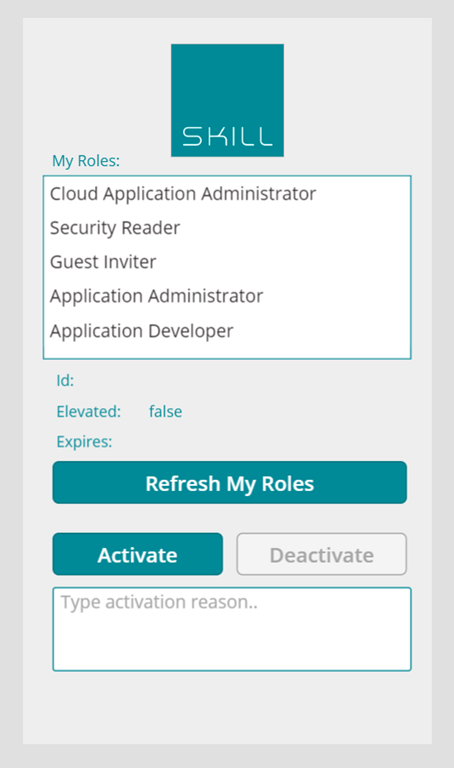 In addition to my selected logo and background, I’ve added labels for listing my roles and selected role details. 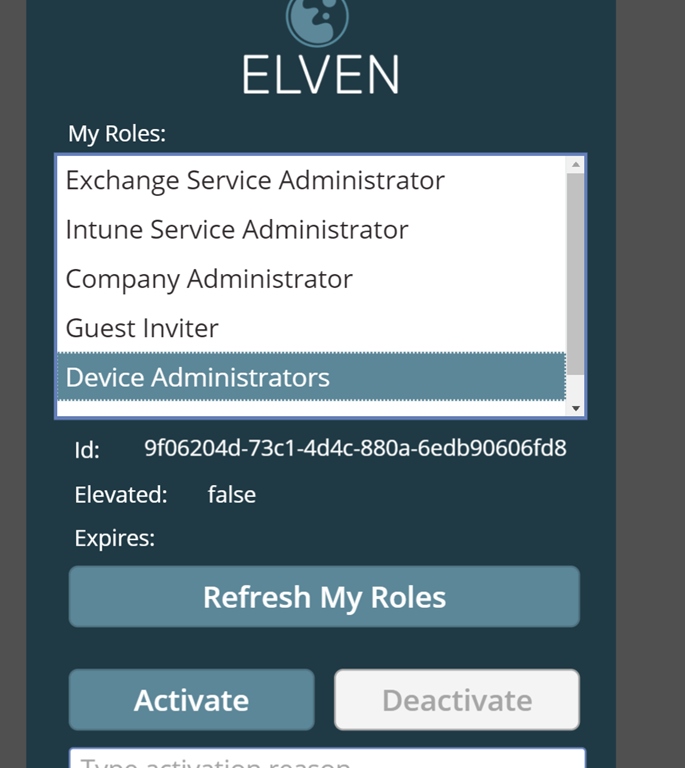 I’ve added three buttons, one for refreshing my roles, and one for activate and deactivate any roles. 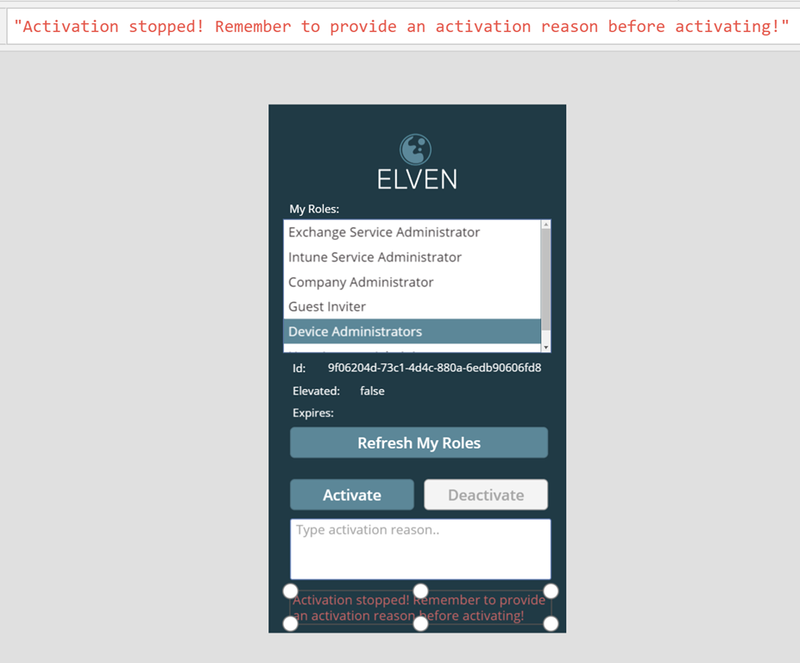 I also have a text box to provide an activation reason, as well as a message label to show/hide any error message if I try to activate without a reason. We’ll get to that later. 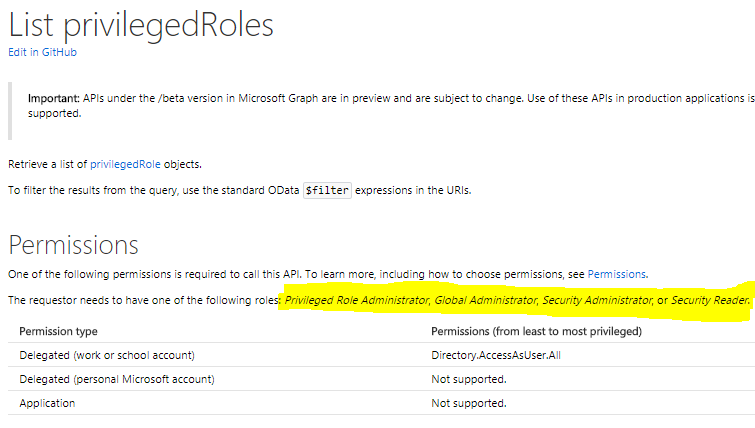 When we tested via Graph Explorer earlier in this blog post, PIM role assignments returned with only role id’s, so we had to do an additional call to list directoryroles to get the displaynames of the roles. 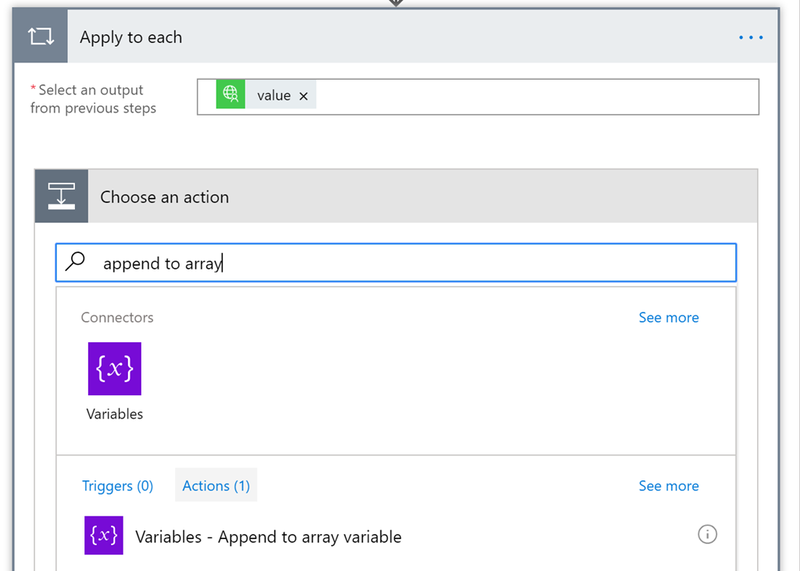 We will now implement some logic in the Flow to achieve this. 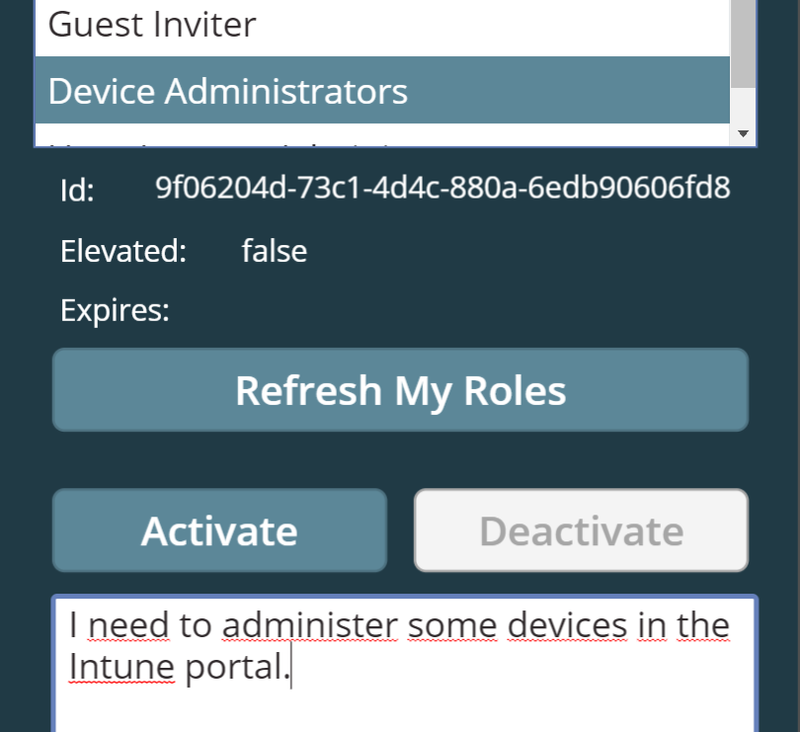 If I scroll down I can see that the output contains all my roles, and have the display name included in the output. 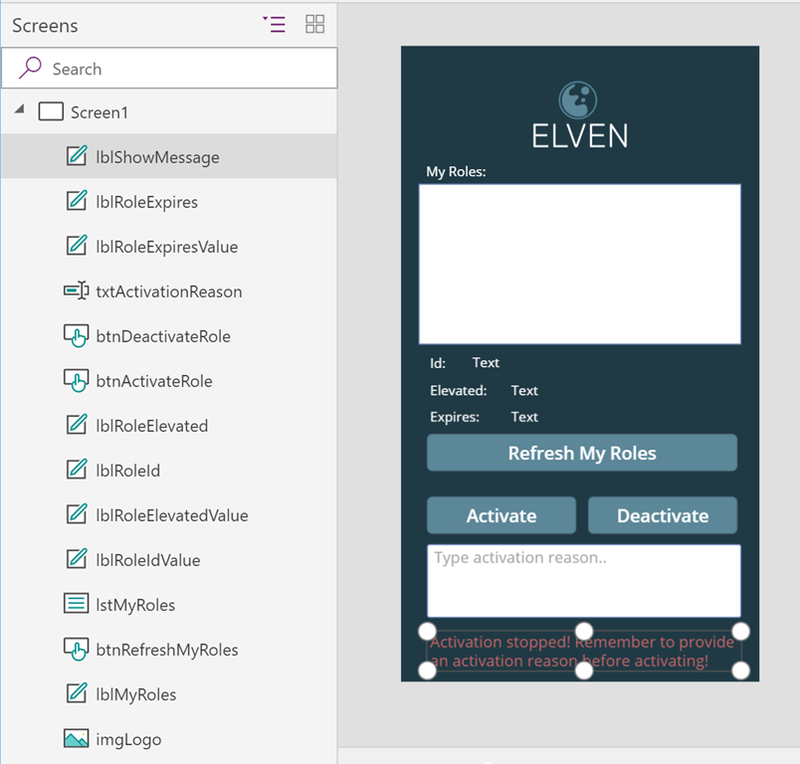 This is the output I eventually will work with in my PowerApp. 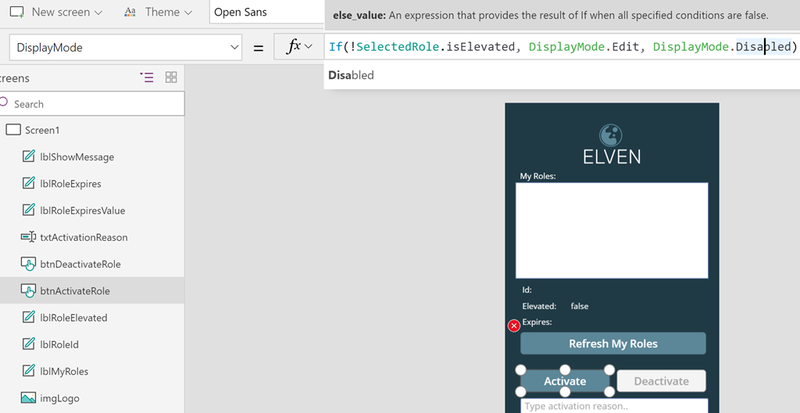 Remember to give the Flow a describing name, and Save it before you proceed to the next section. 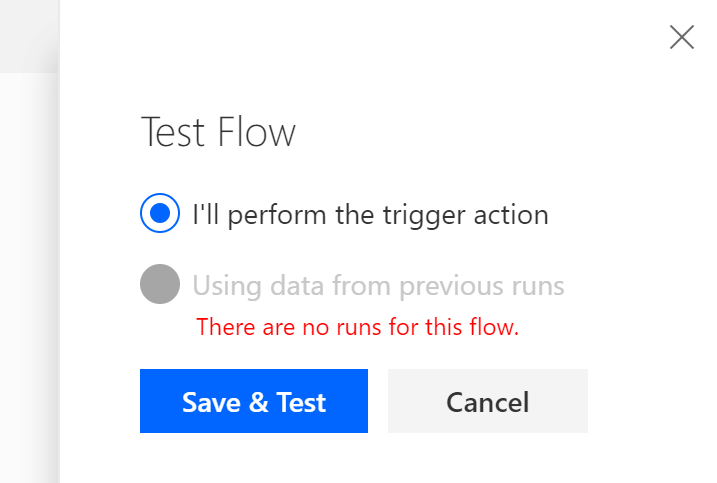 So, now we have created 3 Flows that we will use in the previously created PowerApp. 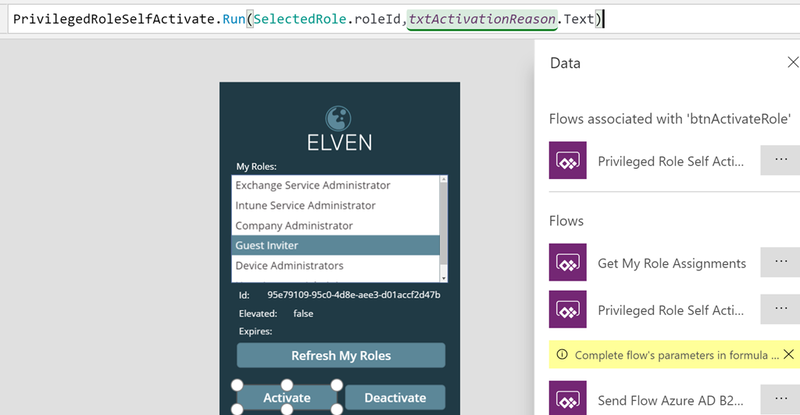 In the next section we will add the flows and provide some logic to the application. 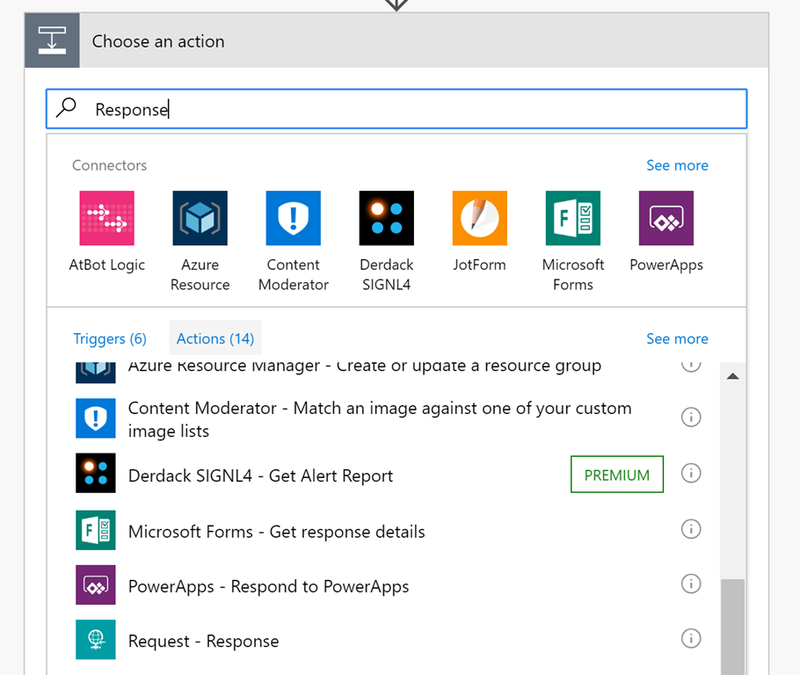 A little explanation, the Set(wait,true) and Set(wait,!true) are used at the beginning and end of the action for indicating that the PowerApp is busy when calling the Flow. 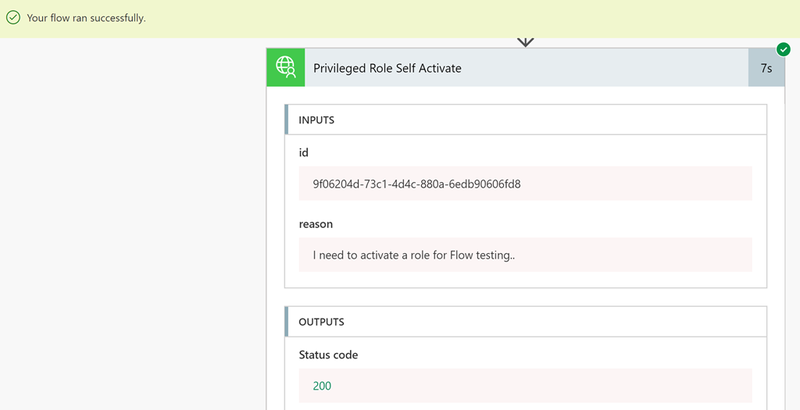 The ClearCollect is used to store the output response we get back from the Flow in a variable; MyPIMRoles. 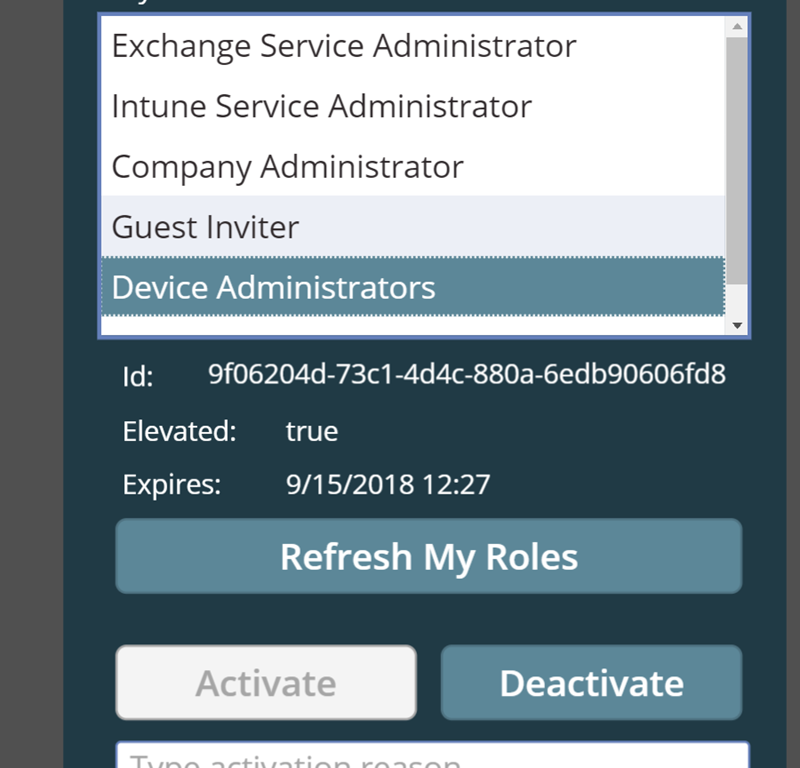 A quick explanation of this: I’m setting a variable “SelectedRole”, every time I click on a role in the listbox, by getting the first instance of the lstMyRoles.SelectedItems. 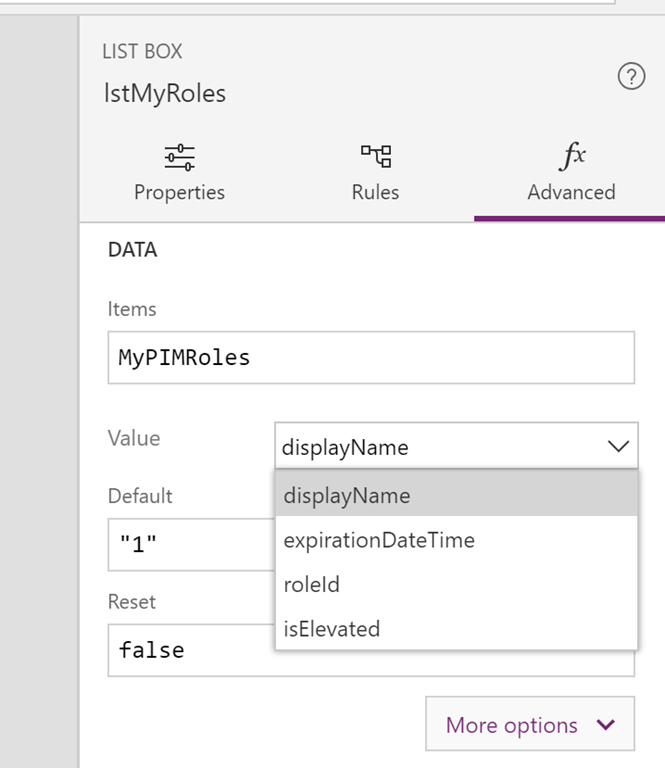 (In fact, as my listbox only allows to select one item at a time, the first will always be the one I selected). 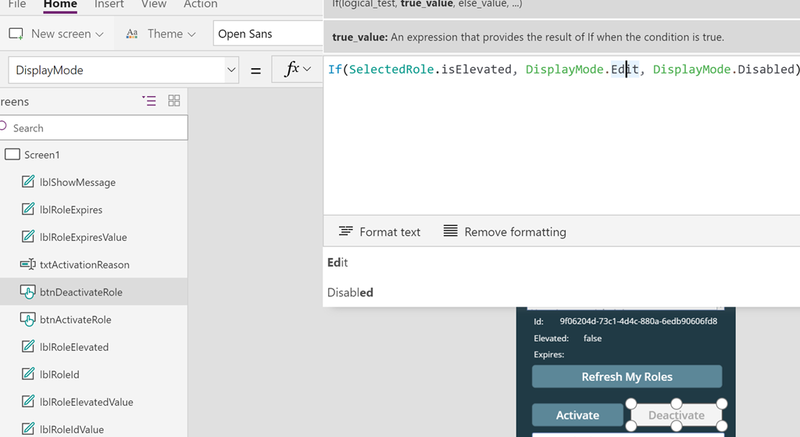 As you can see, I’ve added some format functions to display any date and time values from the selected role in the format of short datetime 24 hour clock. 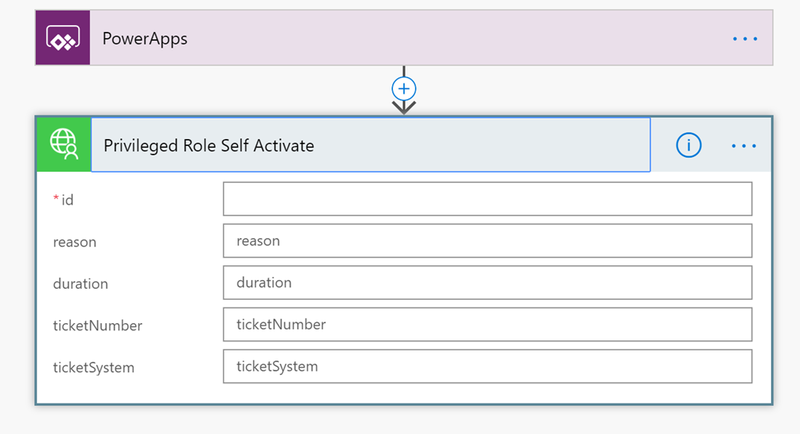 And finally, at the OnSelect method of the lstMyRoles listbox, I’ll set the ShowMessage variable to false whenever I click on different roles in the list, so that any previous activation error message is not shown. That should be it! 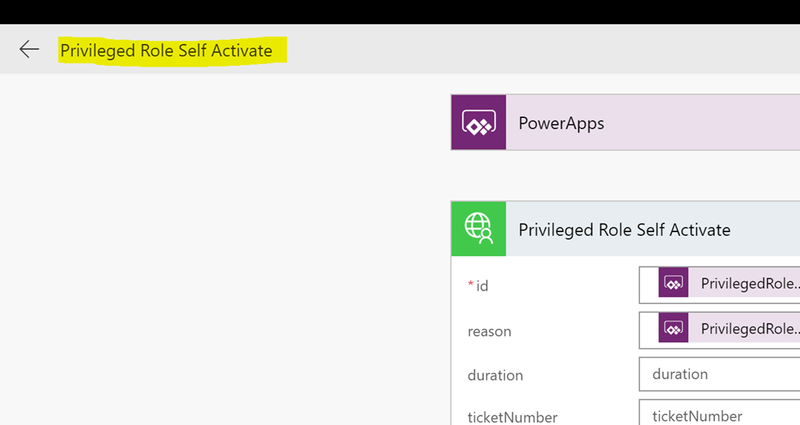 We’ve now implemented some logic to the PowerApp, and are ready to publish and run the App. (please see my previous blog post https://gotoguy.blog/2017/12/17/access-microsoft-graph-api-using-custom-connector-in-powerapps-and-flows/, and the sharing section at the end for details on the experience on this). 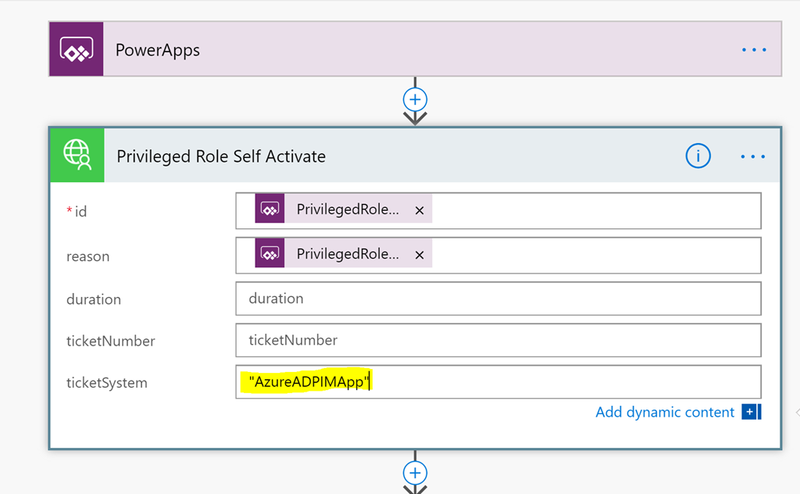 So now the Azure AD PIM App is working as intended, every user that have been assigned a role can now elevate themselves using the App. 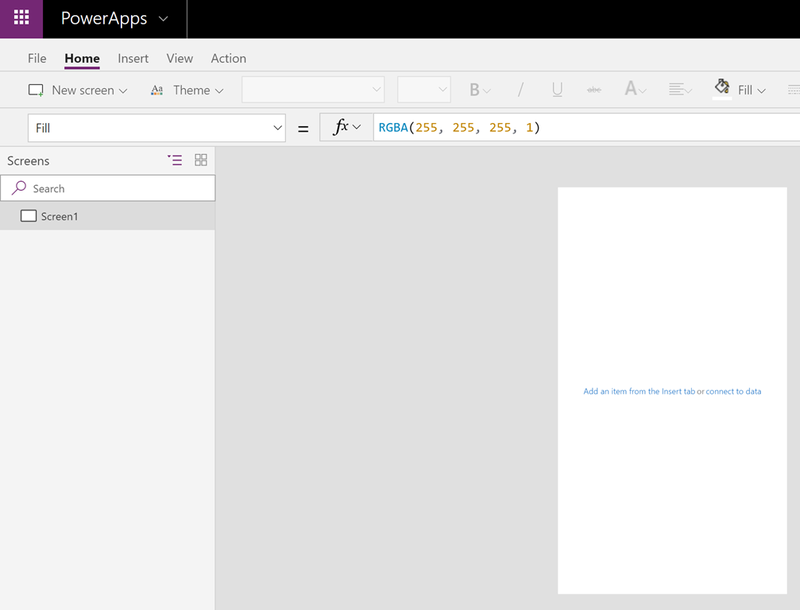 Even better is that my users also now can use the mobile PowerApps app to run this from their mobile phones! 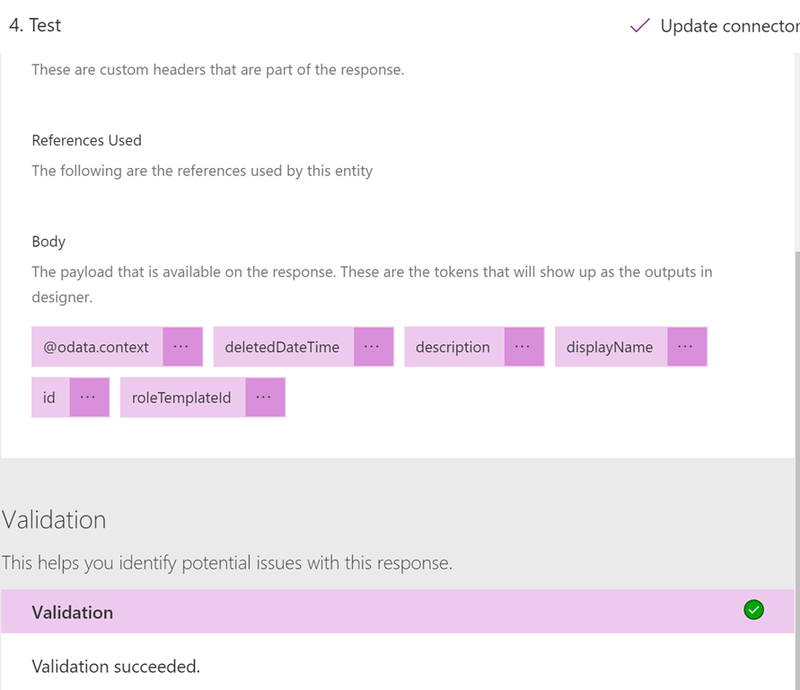 I’ll keep you posted of any changes to this issue, and update the blog post if that changes. 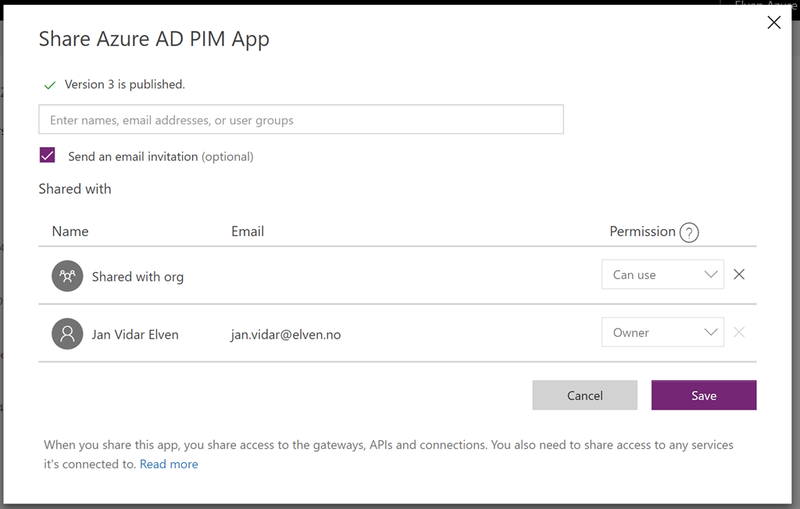 This entry was posted in Azure AD, Azure AD Privileged Identity Management, Microsoft Flow, Microsoft Graph, PowerApps and tagged Azure AD, Azure AD PIM, Microsoft Flow, Microsoft Graph, PowerApps on September 15, 2018 by Jan Vidar Elven. 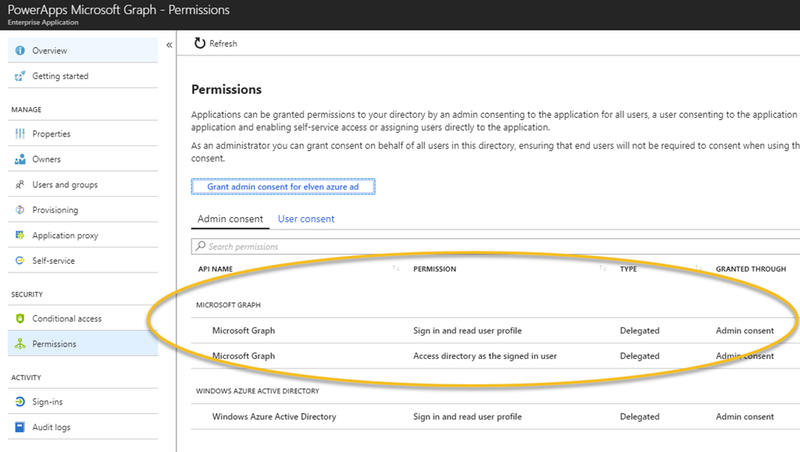 Creates an Azure AD application with a self-signed certificate, creates a service principal account for the application in Azure AD, and assigns the Contributor role for the account in your current subscription. 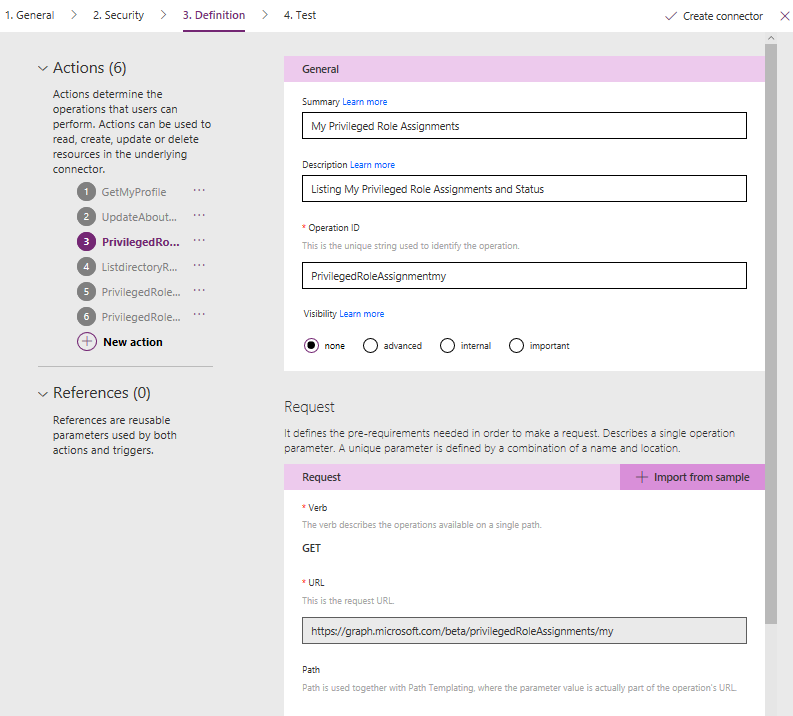 Creates an Automation certificate asset named AzureRunAsCertificate in the specified Automation account. 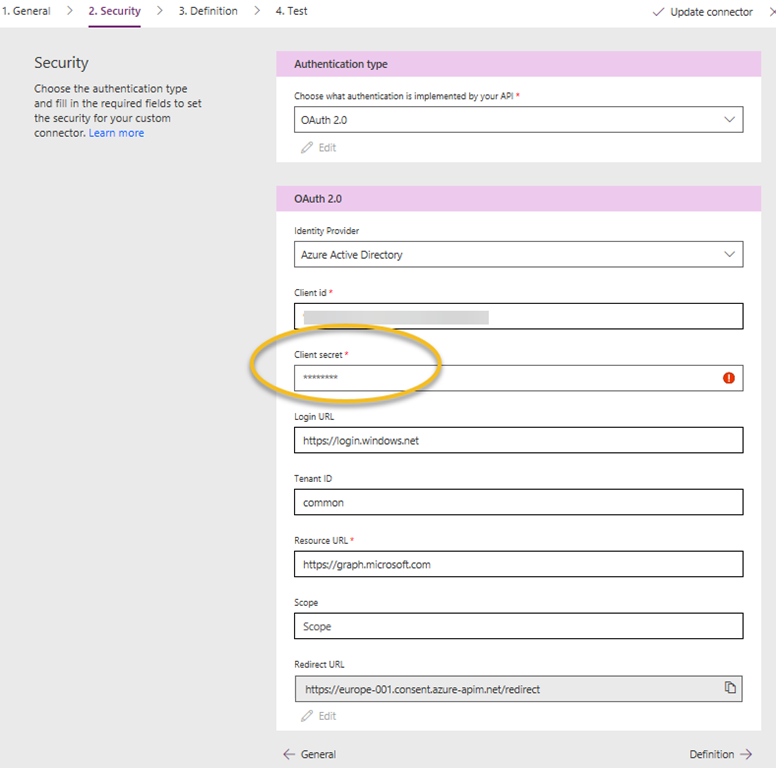 The certificate asset holds the certificate private key that’s used by the Azure AD application. 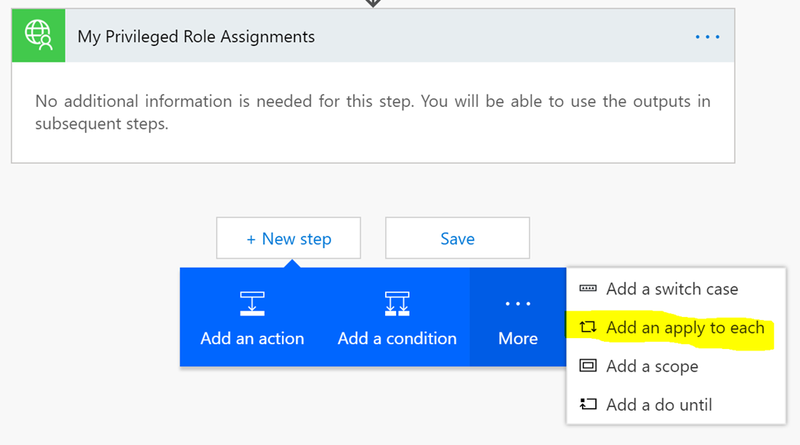 Creates an Automation connection asset named AzureRunAsConnection in the specified Automation account. 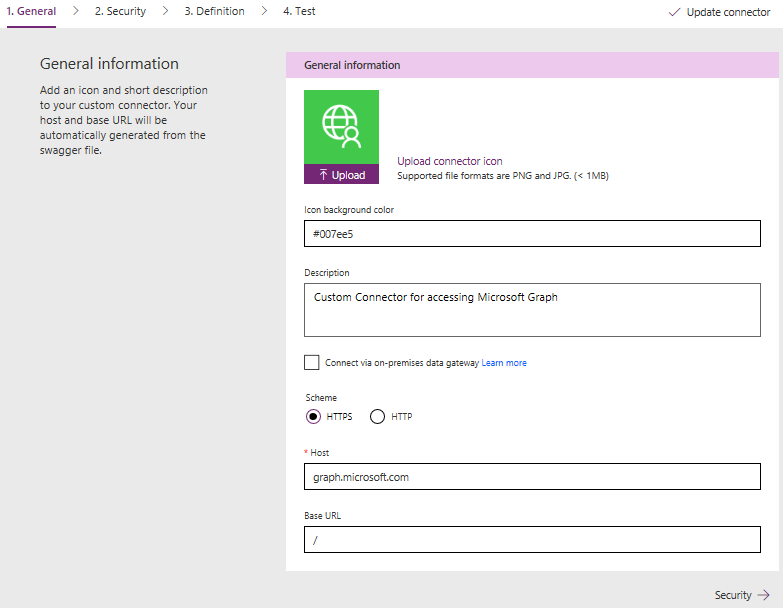 The connection asset holds the applicationId, tenantId, subscriptionId, and certificate thumbprint. 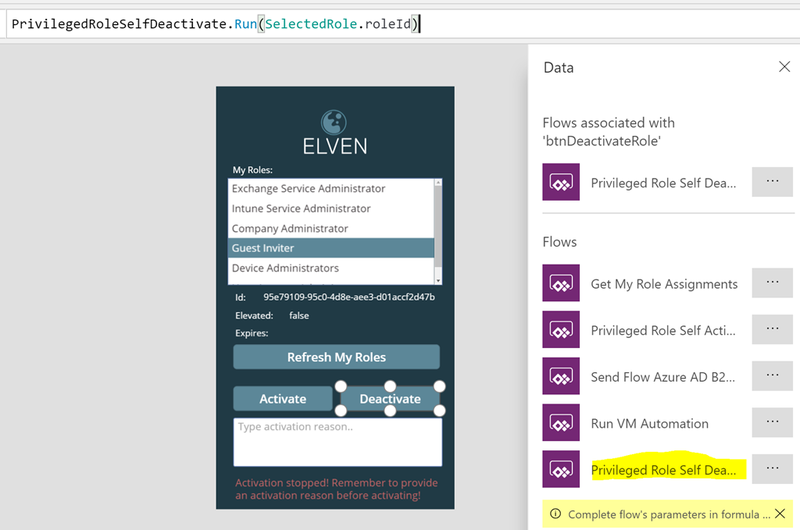 You can read more about setting up Azure Run As Accounts here, including how to do a more customized setup with PowerShell: https://docs.microsoft.com/en-us/azure/automation/automation-create-runas-account. 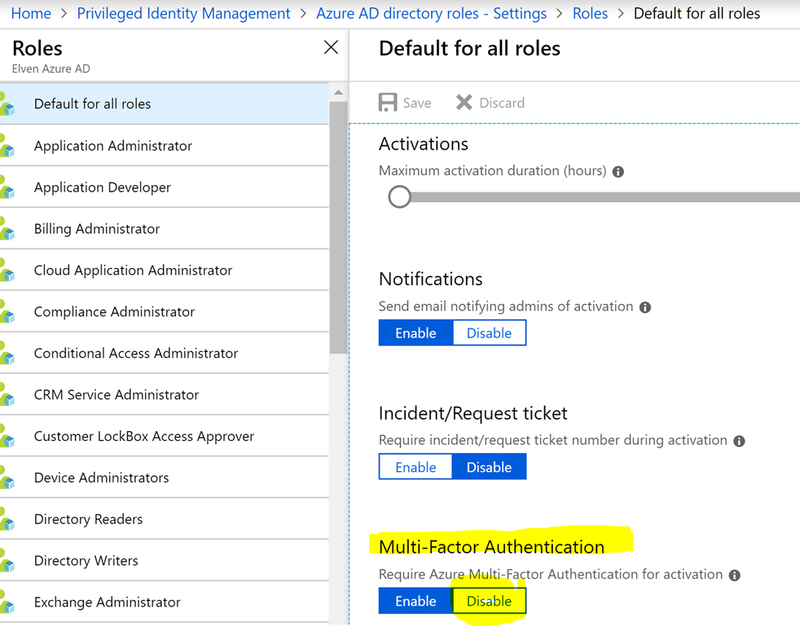 Something worth noting is that this Azure Run As Account will by default have the Contributor role to your entire subscription, so it would make sense to look into changing RBAC settings for the subcription or resource groups if you want to limit that. 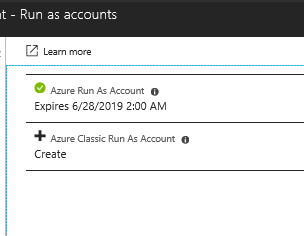 Also, all users that have access to the Automation Account will also have the opprotunity to use this Azure Run As Account. 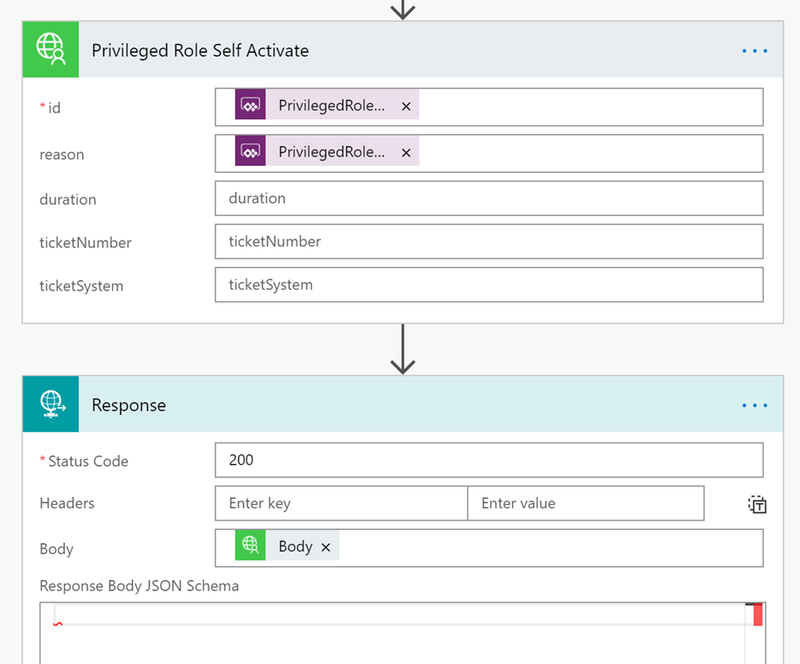 Having said that, the Azure Run As Account is a great way to authenticate securely with certificates and a service principal name without needing to store a username and password in a credential object. 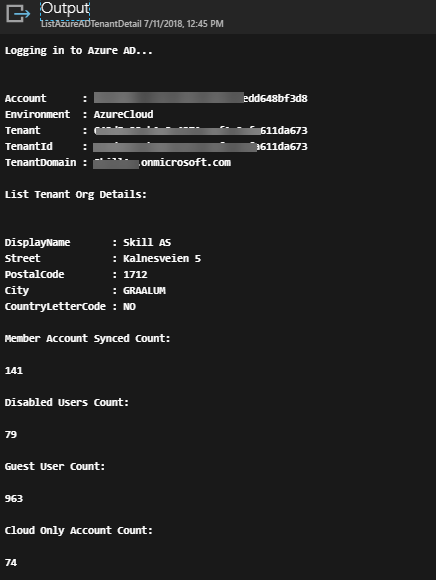 So I thought, wouldn’t it be great if we could use this same Azure Run As Account to log in to your Azure AD tenant for the possibility to run Azure AD PowerShell commands? 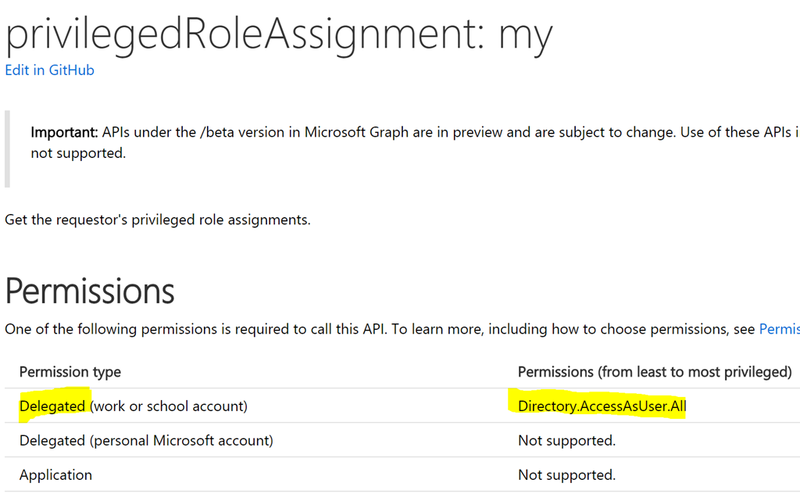 The reason I thought of this is because of this article showing how to authenticate with Azure AD v2 PowerShell and Service Principal: https://docs.microsoft.com/en-us/powershell/azure/active-directory/signing-in-service-principal?view=azureadps-2.0. 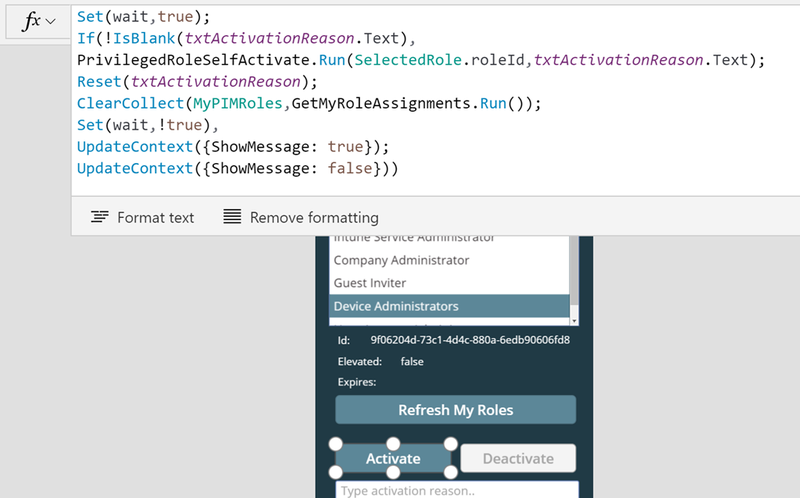 In this short blog post will show you how to do this. 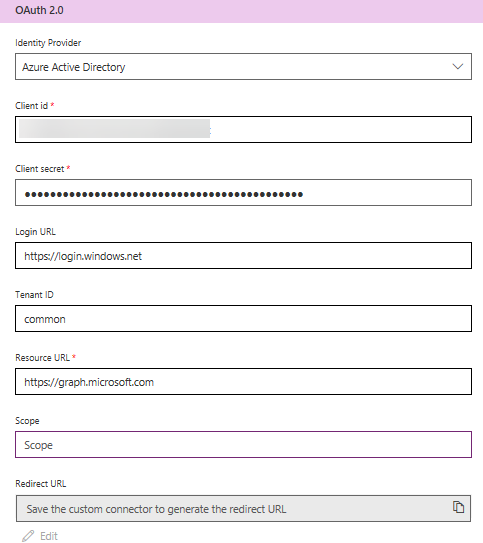 Now, let’s create a PowerShell runbook using the Azure Run As Account for connecting to Azure AD. 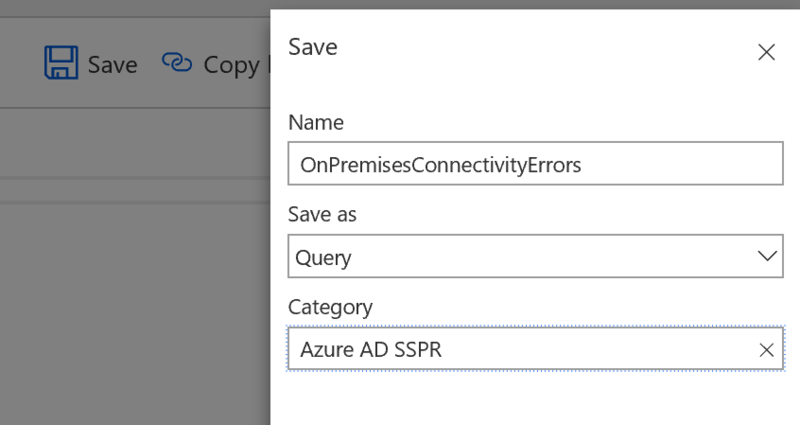 First, I set the connection name “AzureRunAsConnection”, and then save that as a variable for holding my service principal details using the Get-AutomationConnection cmdlet. 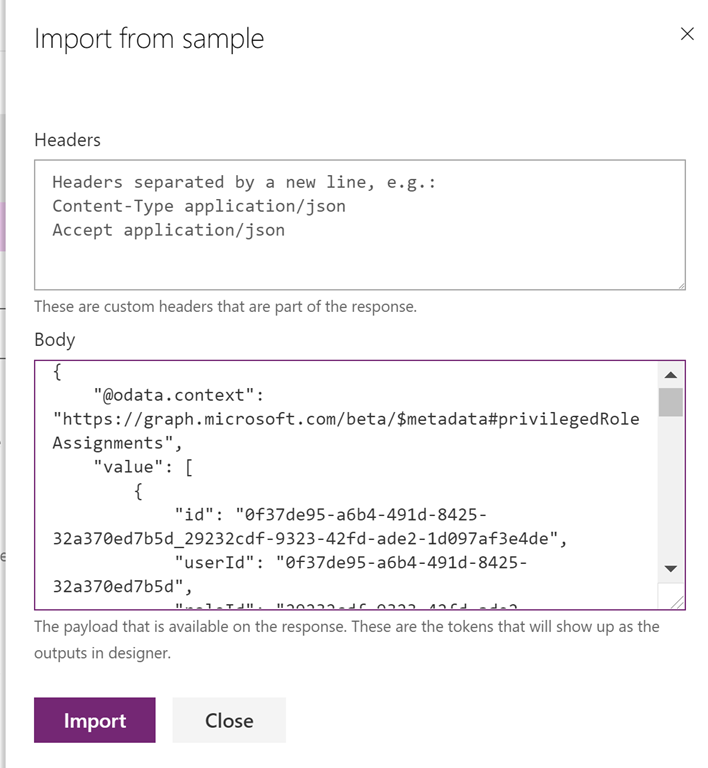 $runAsServicePrincipal = Get-AzureADServicePrincipal -ObjectId ""
This entry was posted in Azure, Azure AD, Azure Automation, Enterprise Mobility + Security, PowerShell and tagged Azure AD, Azure Automation, PowerShell on July 11, 2018 by Jan Vidar Elven.